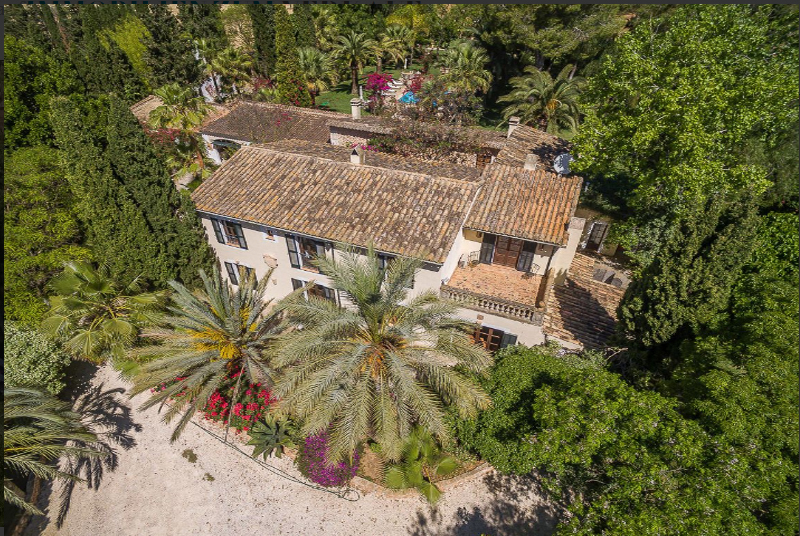 Backed by the Tramuntana mountain range this luxurious, new Finca boasts a spectacular location and breathtaking panoramic coastal views from almost every room. 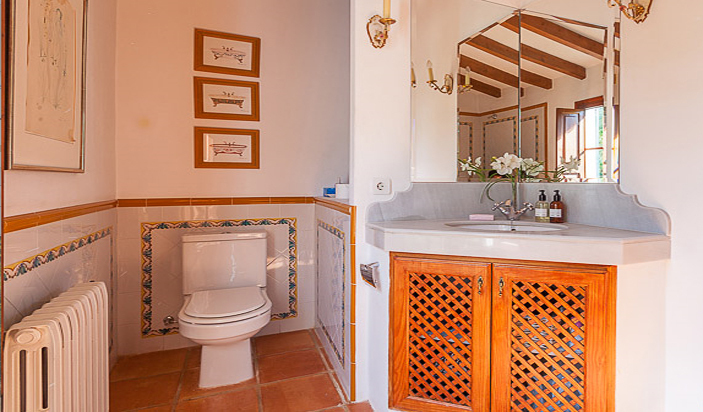 With regard to indoor and outdoor decoration and furnishing of this elegant holiday home no expense has been spared. 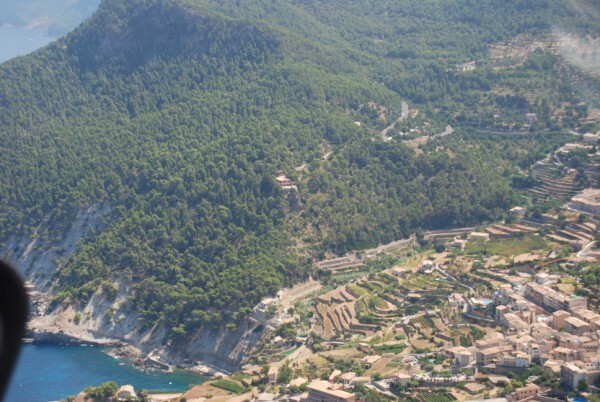 Several cafés and restaurants, as well as a small supermarket can be found in Banyalbufar about 3 car minutes away. 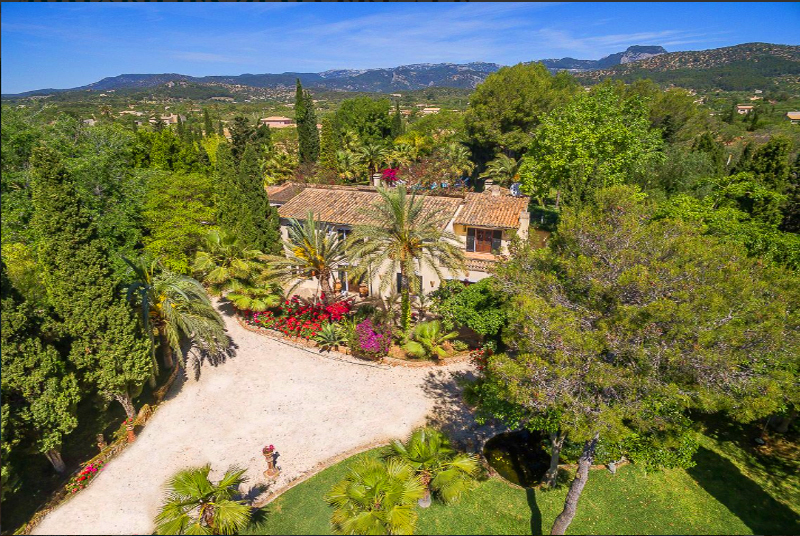 Down to the scenic small pebble beach you will need about 5 car minutes- and it is about 45 and 50 minutes to the centre of Palma and the airport. 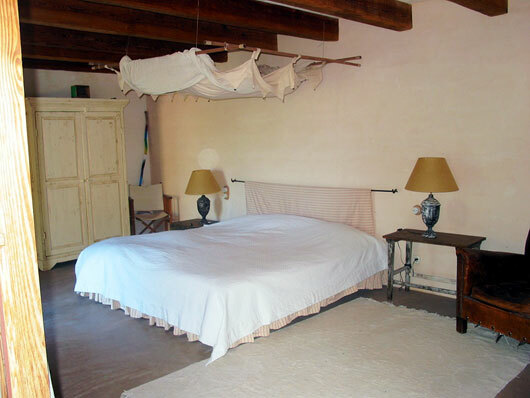 Calmada Naturaleza is a large historic property, which originally consisted of 7 small Fincas and which has been completely restored during the past years. 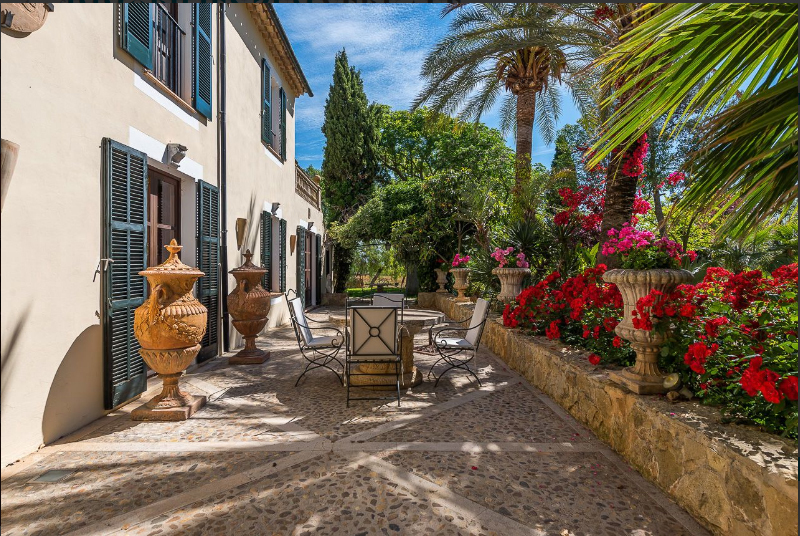 Today the entire property boasts extravagantly spacious living areas with various terraces and balconies, which combine to a luxurious, stylish country home, providing for ample possibilities to retreat within the house, as well as outside in the lush gardens surrounding the very large pool. 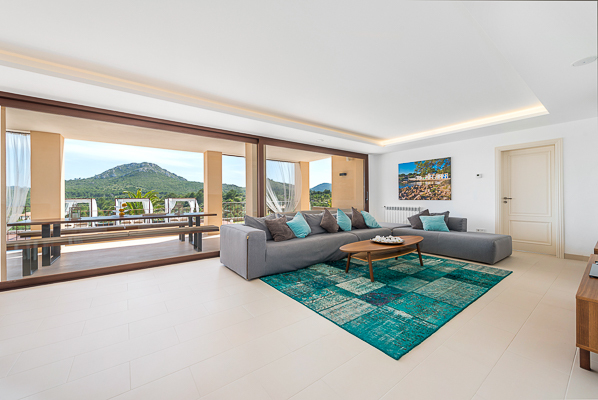 The new built villa is situated in S'Alqueria Blanca in the south east of Mallorca and offers special sea views to the island of Cabrera. 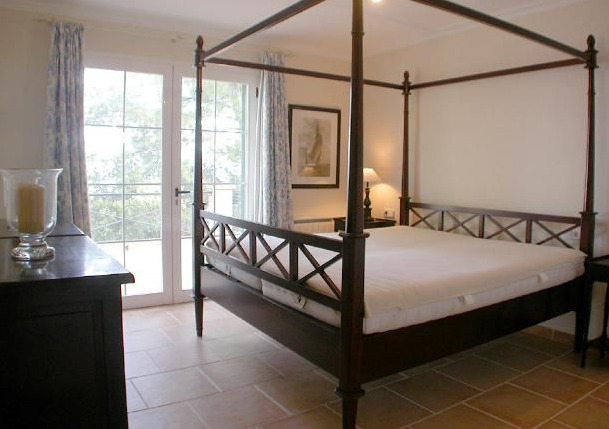 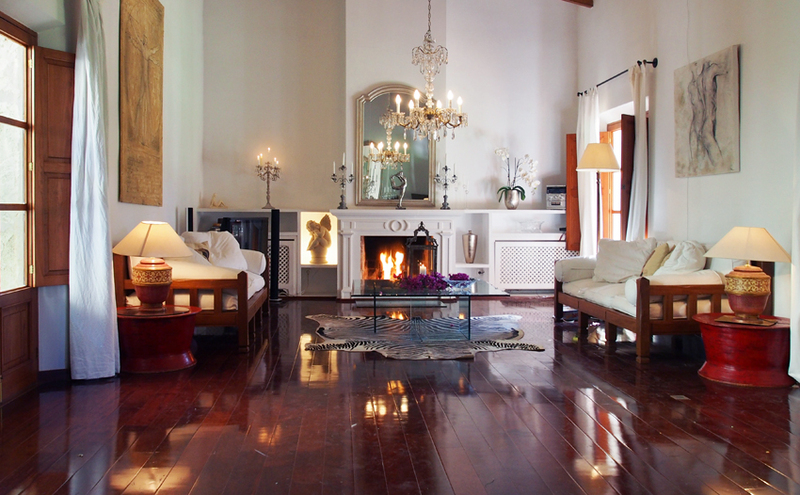 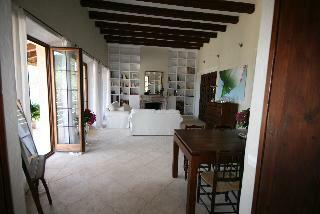 The luxurious property is oriented to the south and very lightly and sunny. 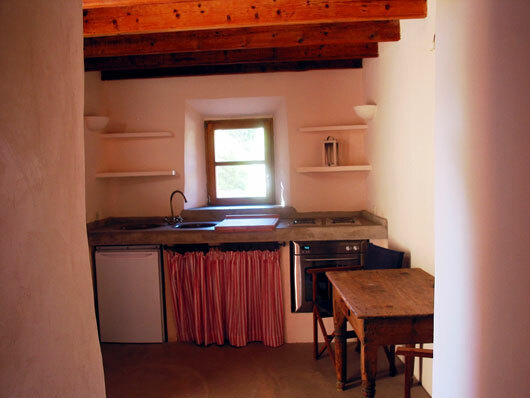 The small place S´Alqueria Blanca is just a few minutes away and offers some good bars and restaurants. 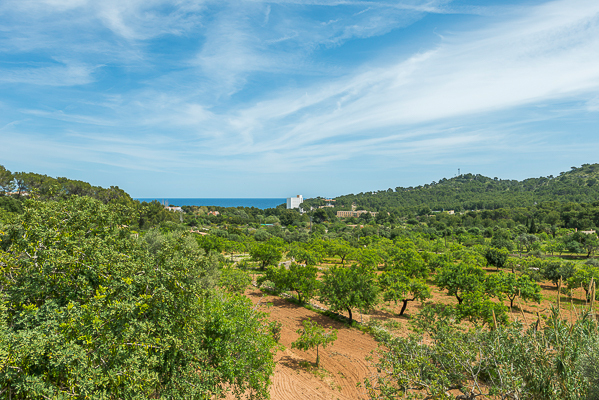 Several beaches are near to reach, like the sandy beach of Cala Mondragó and the beach S'Amarador in the natural park Mondragó. 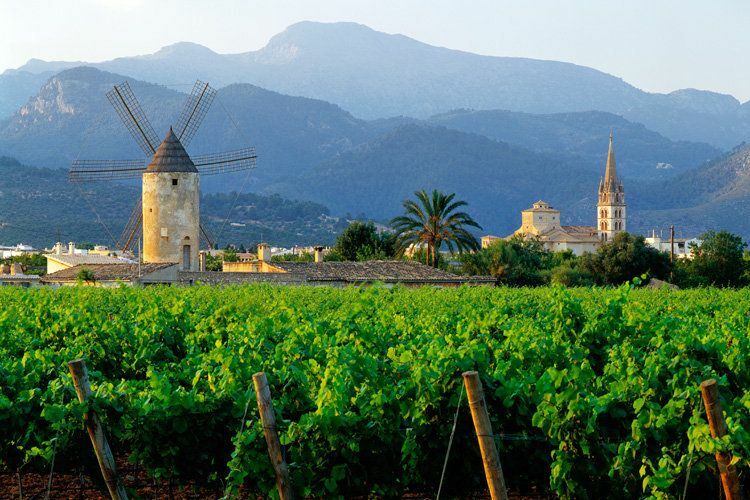 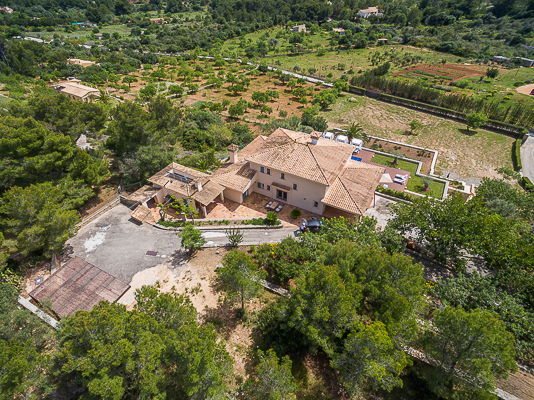 The beautifully situated golf course Vall d' Or is also only a 10 minute drive away. 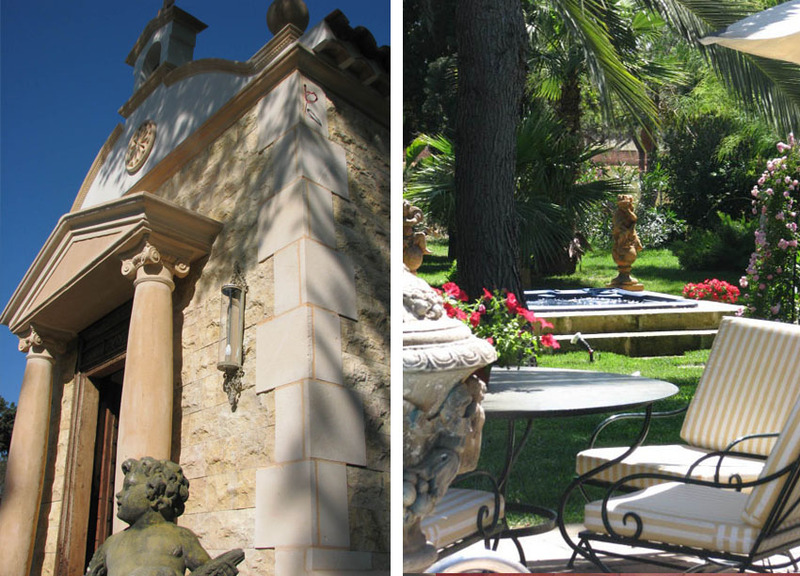 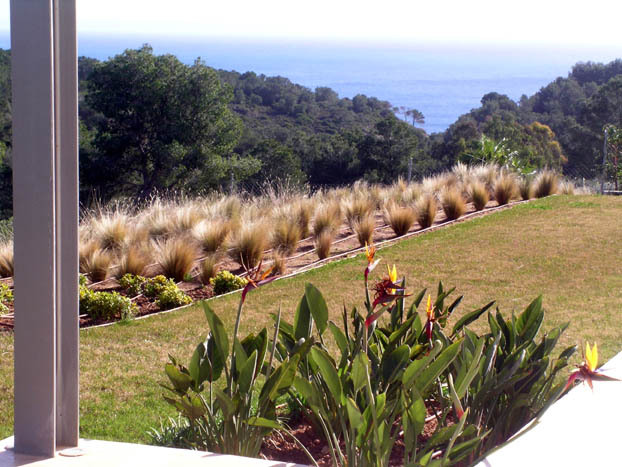 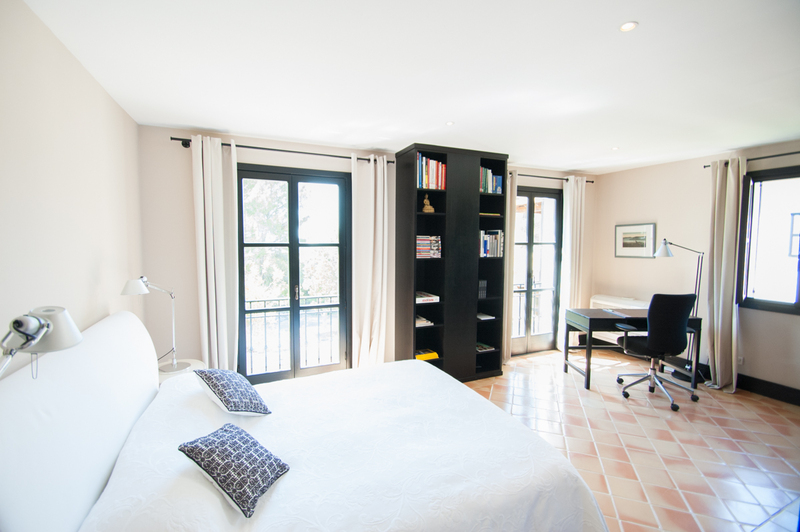 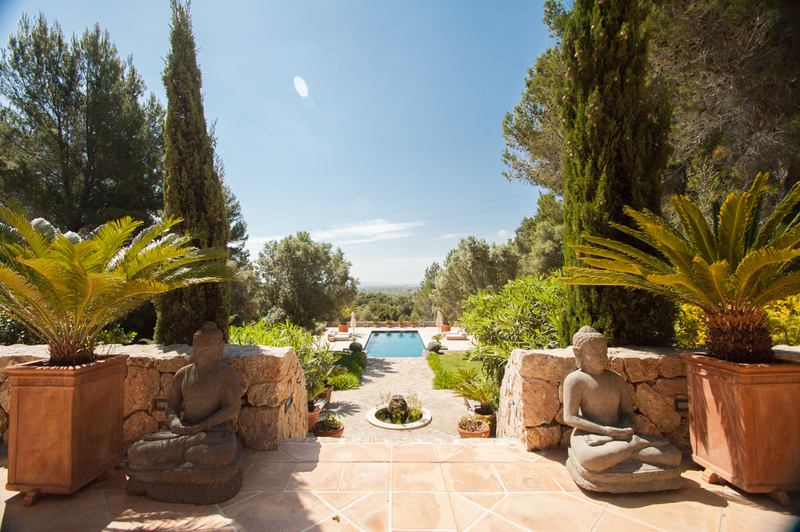 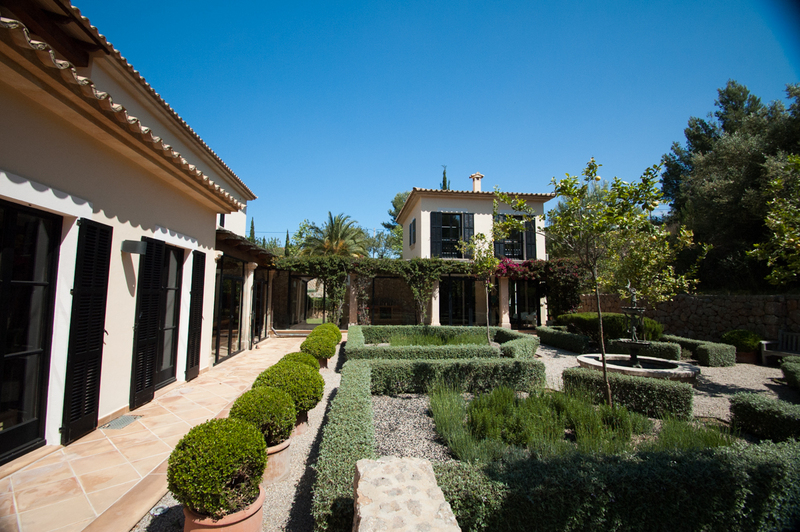 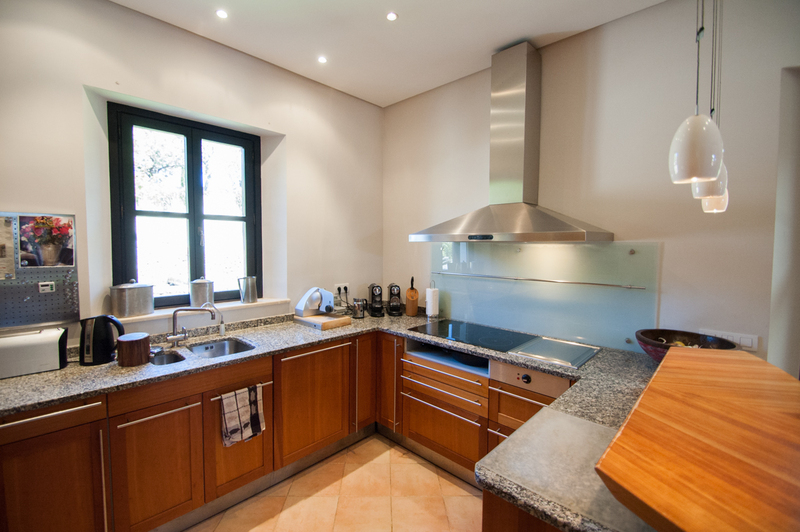 This new and exclusive property rests peacefully on a 25.000m² plot near the town of Campos. 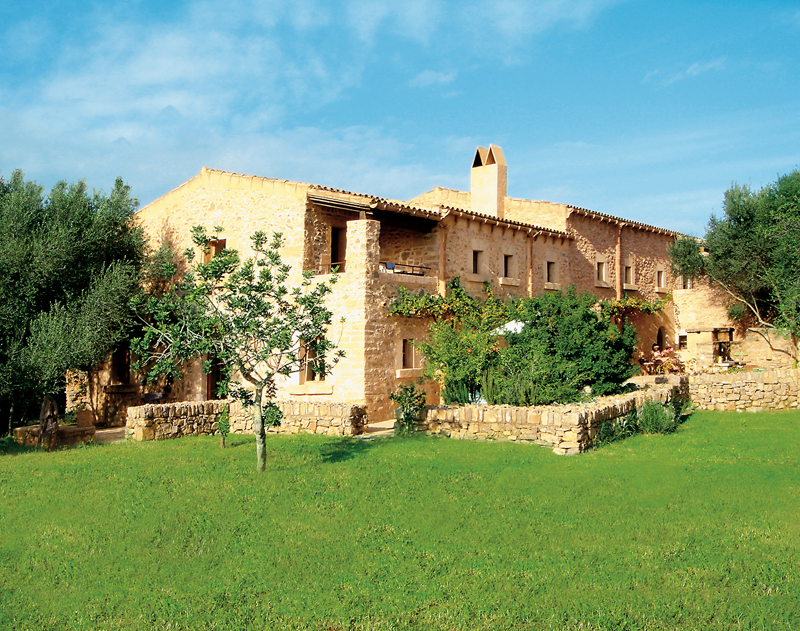 It is the perfect house for a quiet family holiday. 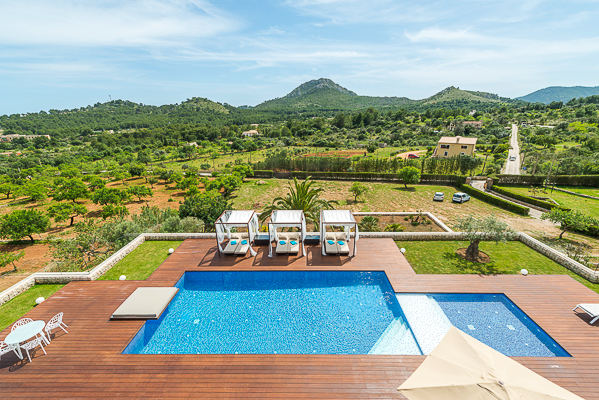 Next to the pool with a shallow water side for children, the outdoor entertainment area of the holiday home offers a comfortable seating area with lounge furniture, a summer kitchen, a sauna, a beach volleyball court and an outdoor shower and toilet. 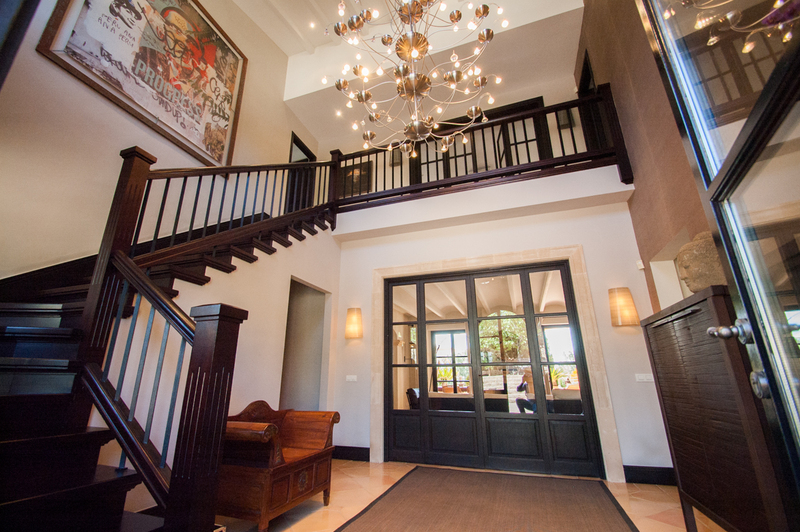 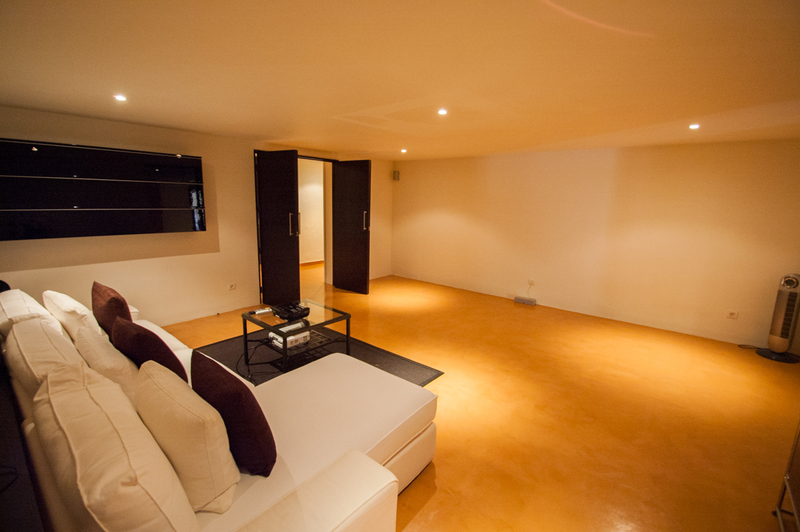 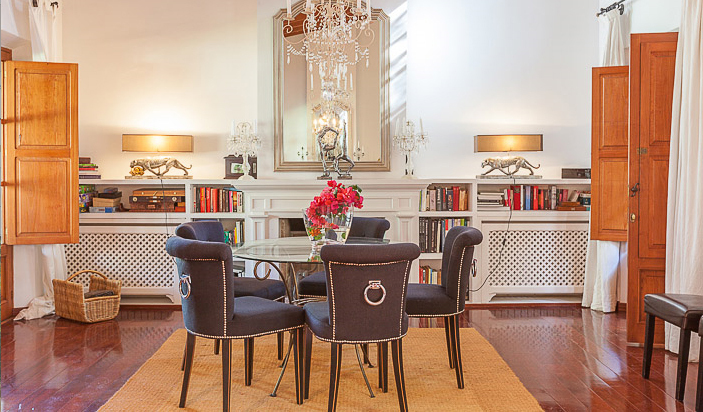 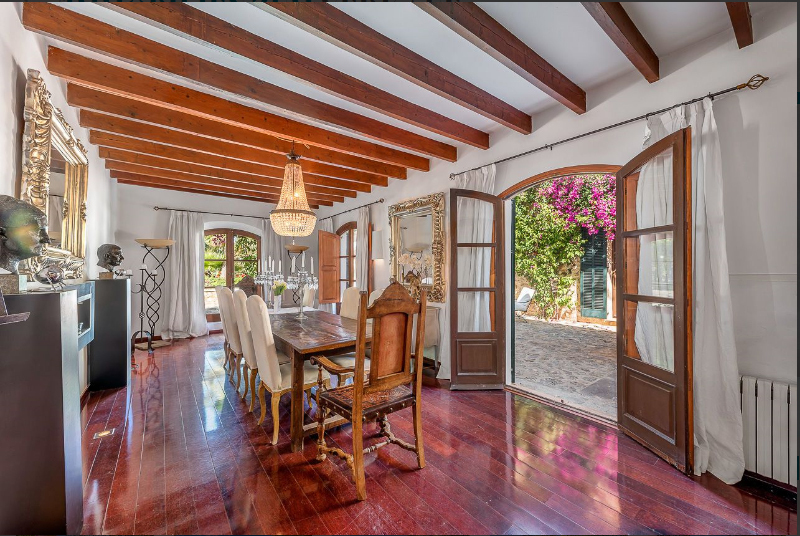 Inside the house boasts bright, light-flooded rooms and a high-quality and stylish interior. 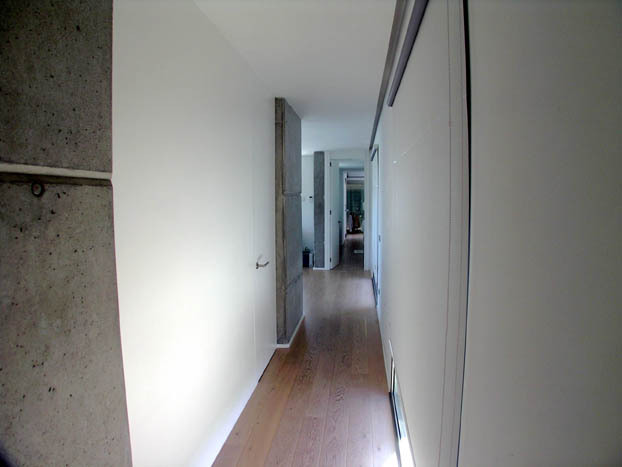 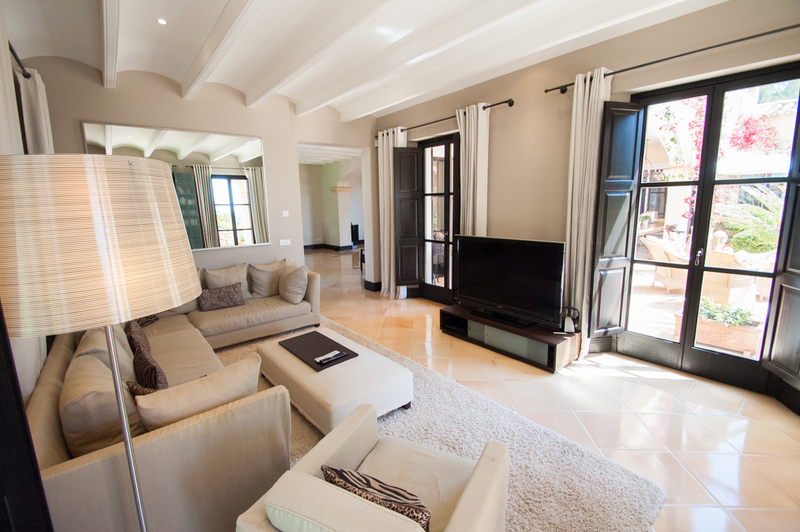 It hosts 6 bedrooms, 2 bedrooms of which are separated by lockable sliding doors, so these are ideal rooms for a family. 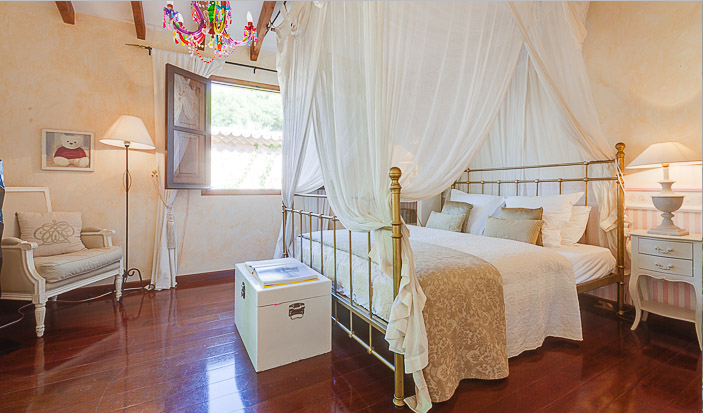 All bedrooms are equipped with ceiling fans. 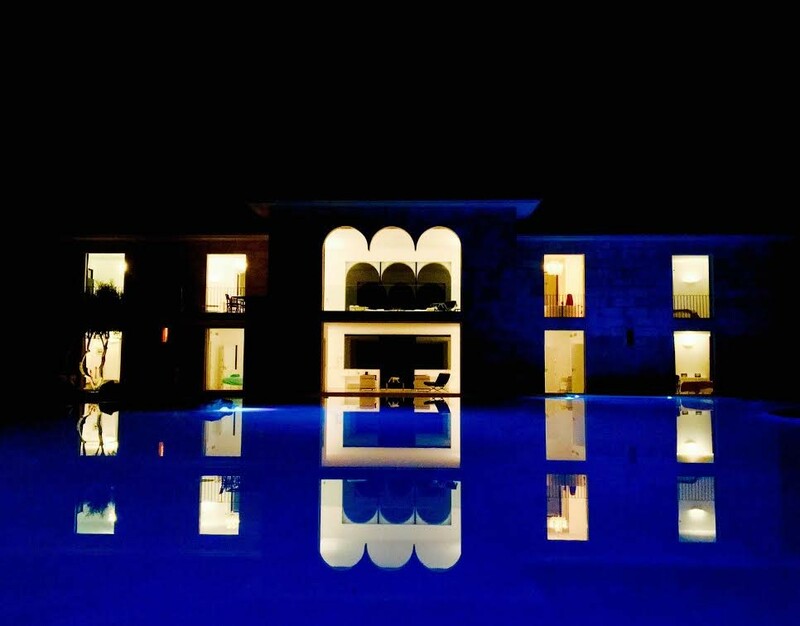 A highlight of this exclusive holiday retreat is definitevly the spectacular swimming pool of 33 meter length and with sandy beach. 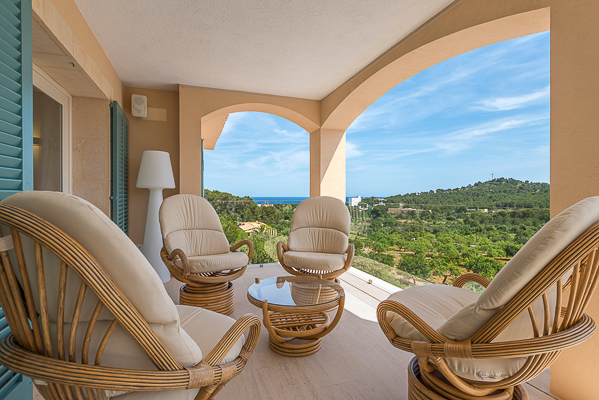 Villa Bella Vista offers fantastic sea views and is located in a quiet residential area just before the end of a dead end, which merges into a cozy hiking trail. 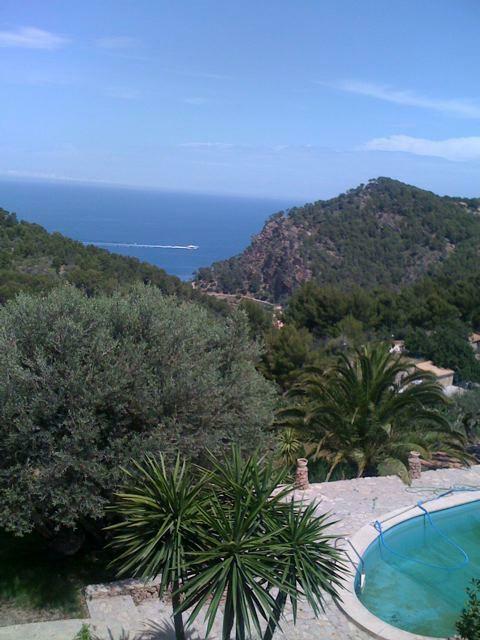 It´s only a few minutes drive to reach the village and the beach. 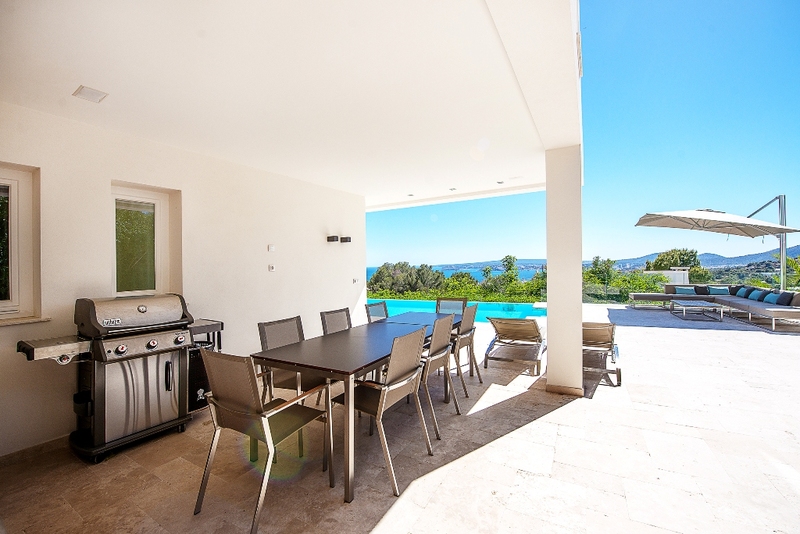 There is a fully equipped outdoor kitchen with dining area at the pool terrace, which can be extended to 12 or more people. 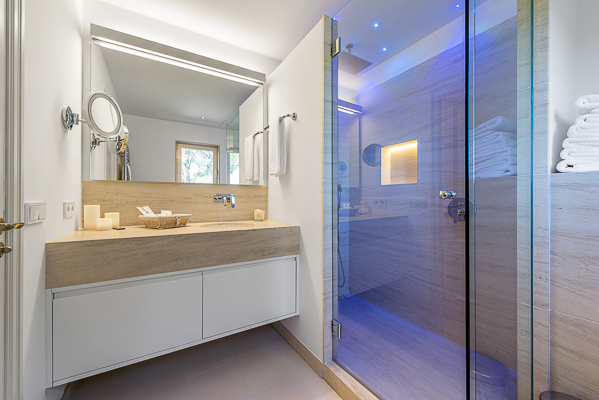 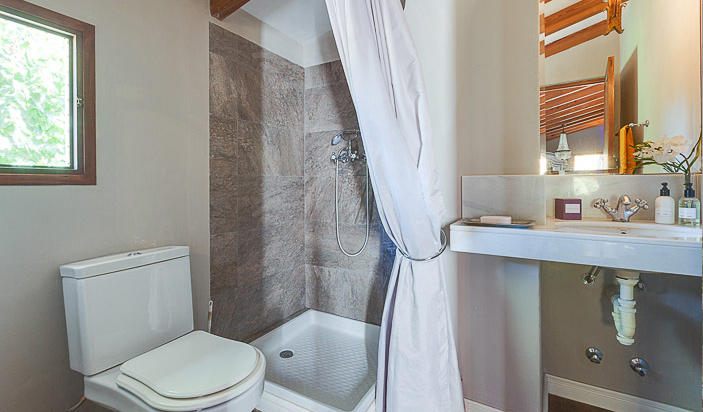 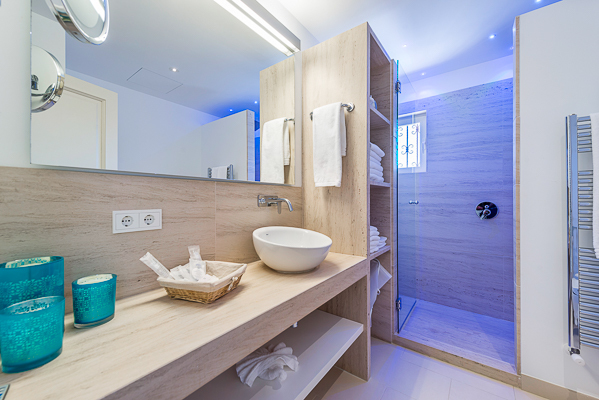 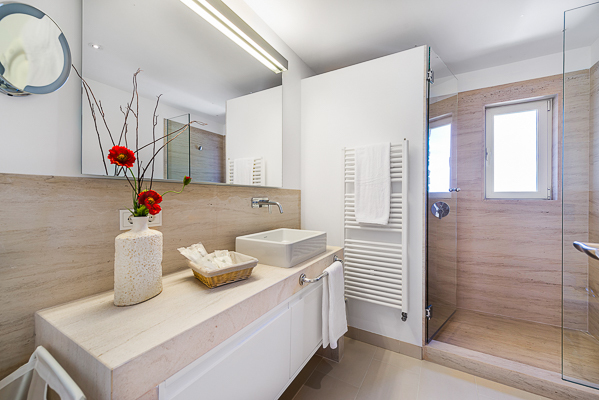 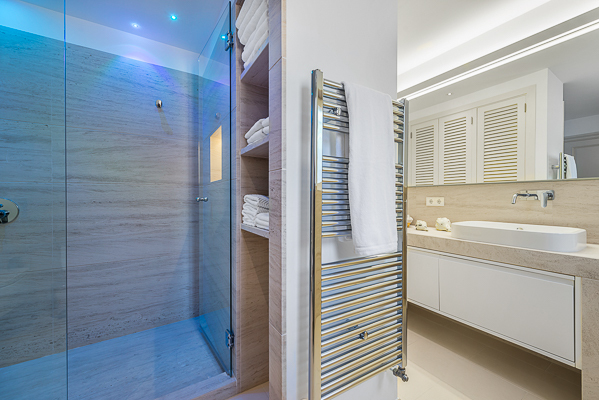 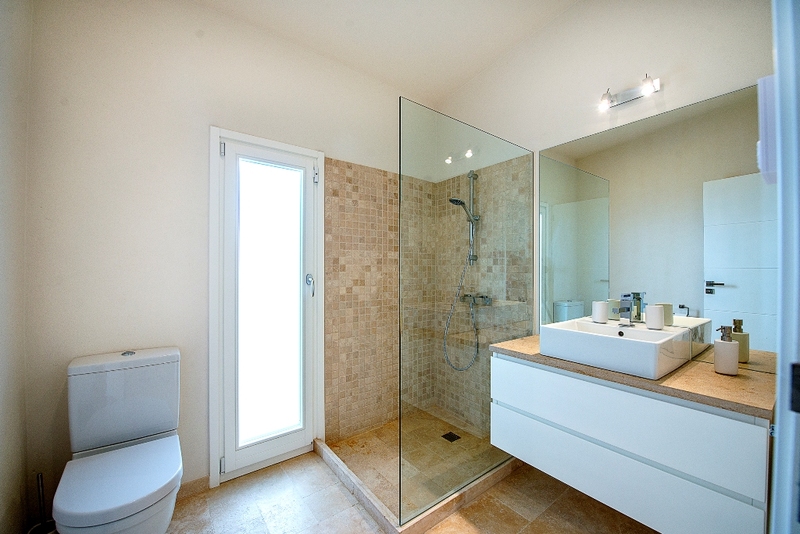 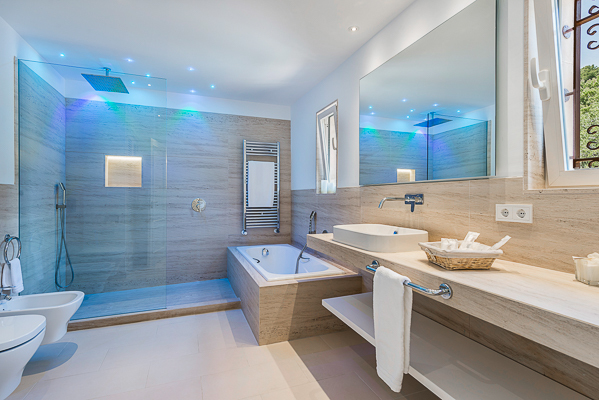 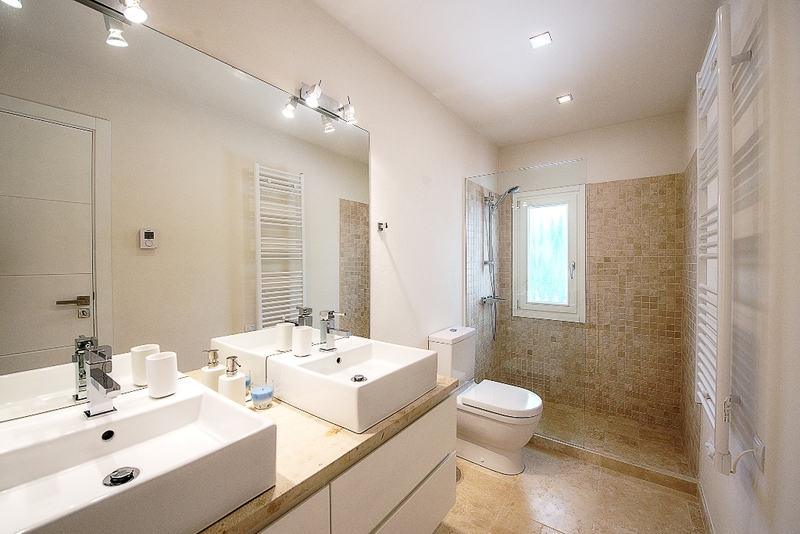 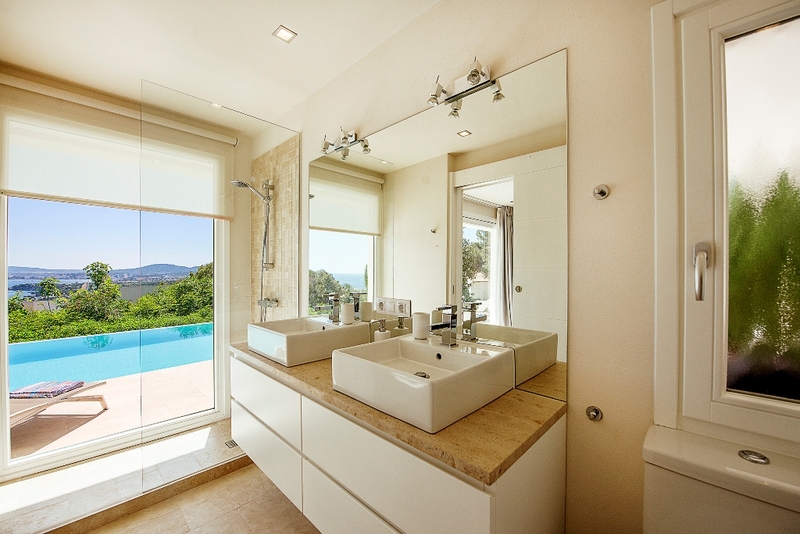 You also can find an extra bathroom with toilet and shower on the pool level. 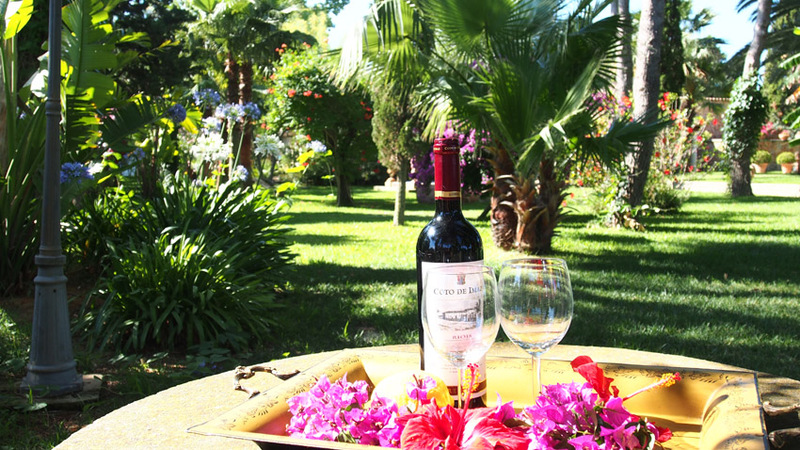 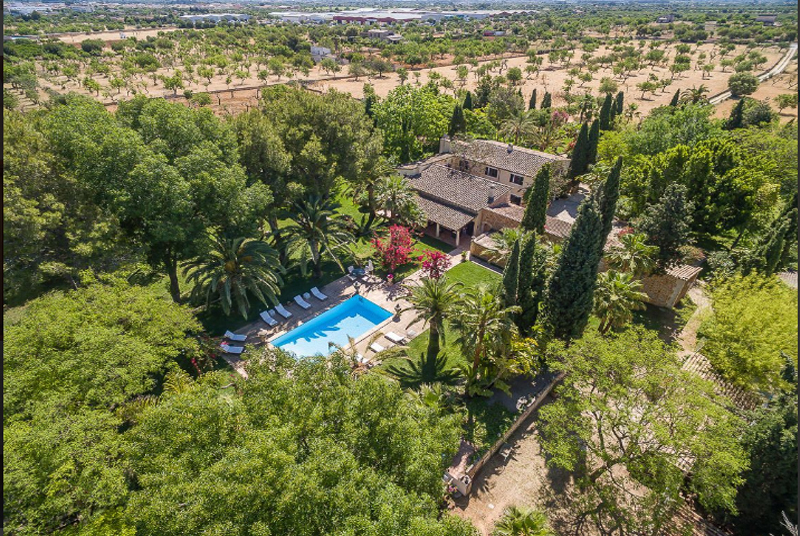 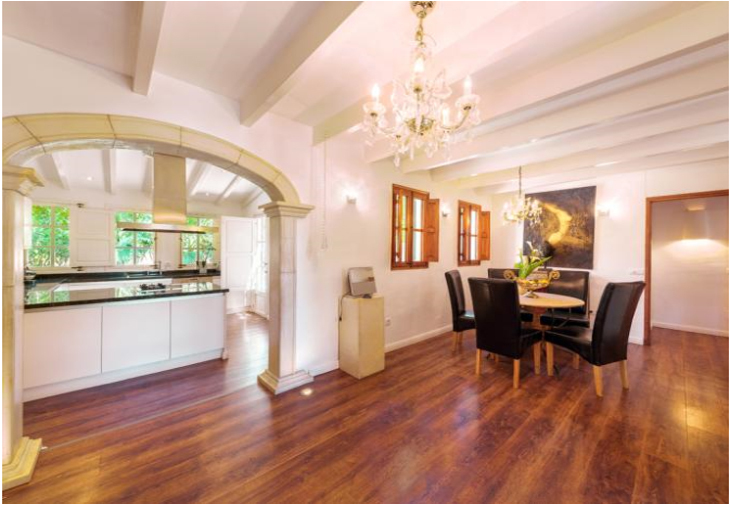 This beautiful and spacious country home with 600m² living space and own tennis court, is an exclusive hideaway for discerning guests and the exceptional pool garden with violet flowering Jacarandas, palm trees, peach and apricot trees as well as numerous exotic resinous woods will delight nature lovers. 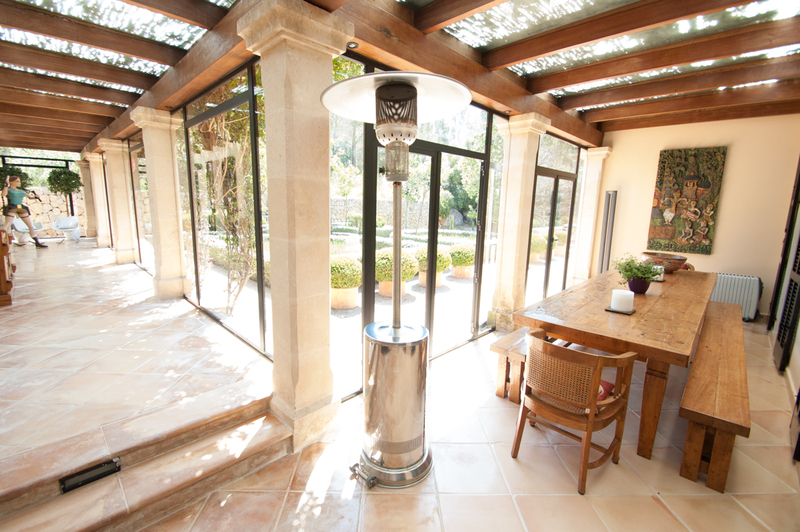 Central heating provides for all year occupation. 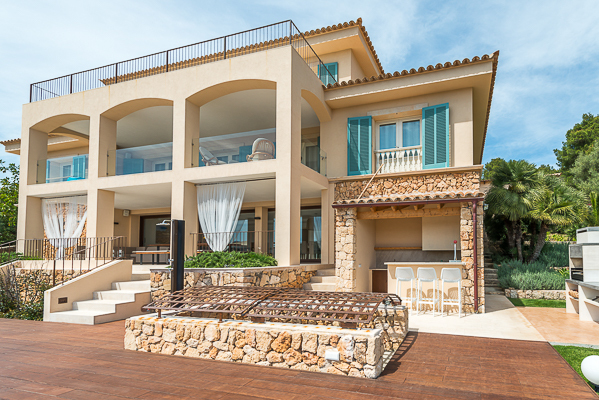 High up in the posh residential area of Portals Nous, Villa Maria proudly resides with faboulous views of the yacht harbour. 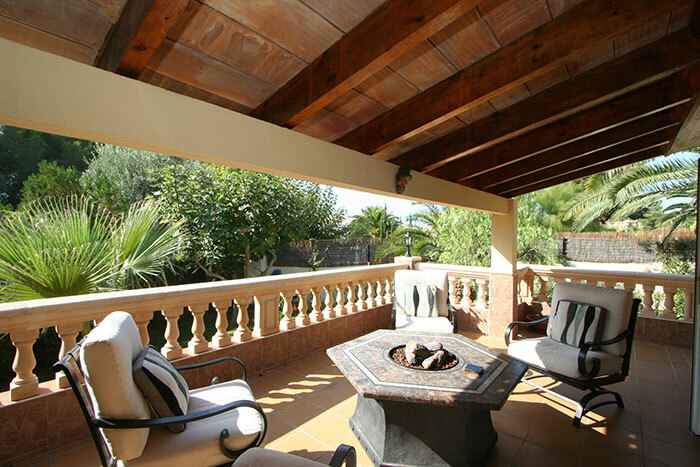 The lifely waterfront and the marina of Puerto Portal is a 3 minute drive away. 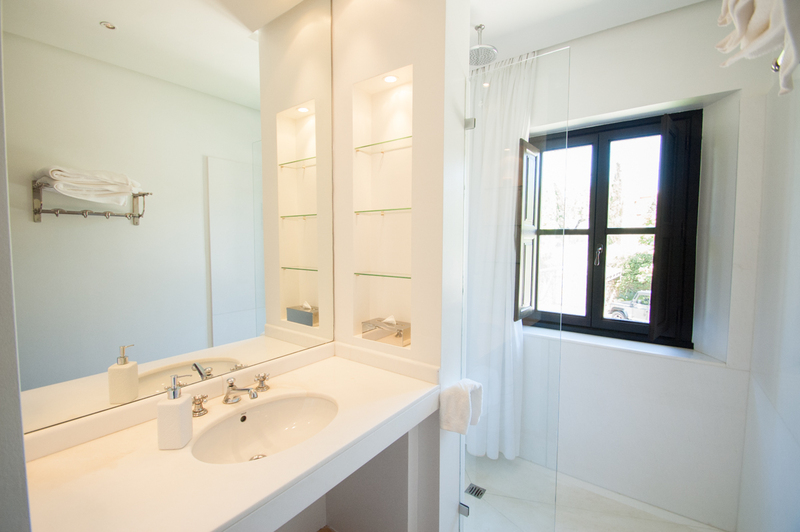 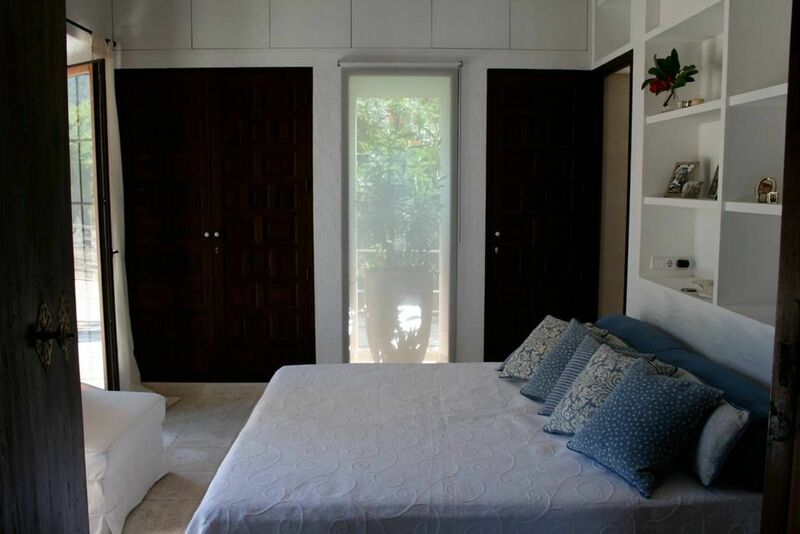 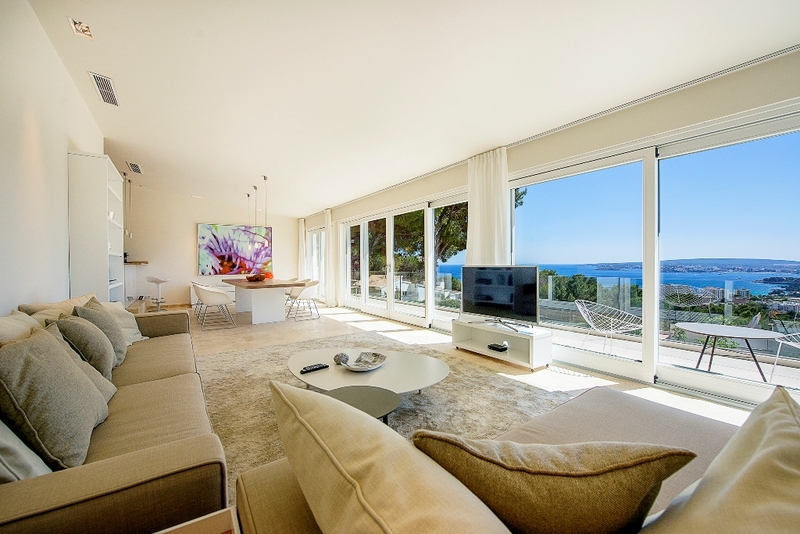 The white villa boasts a contemporay design, style and furnishing, providing for a high living comfort. 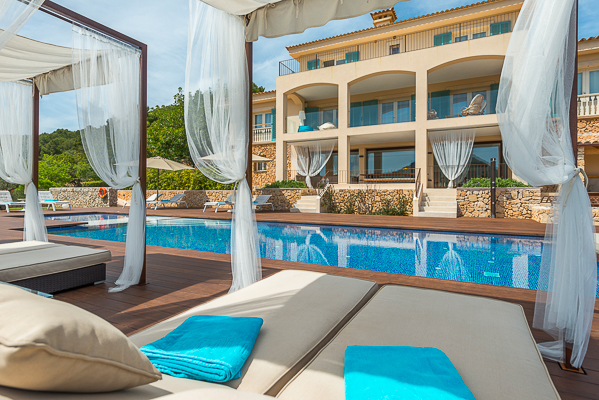 From the terraces enjoy inspiring views of the deep blue sea – and at night, be enchanted by the colorful light-system of the pool and the villa. 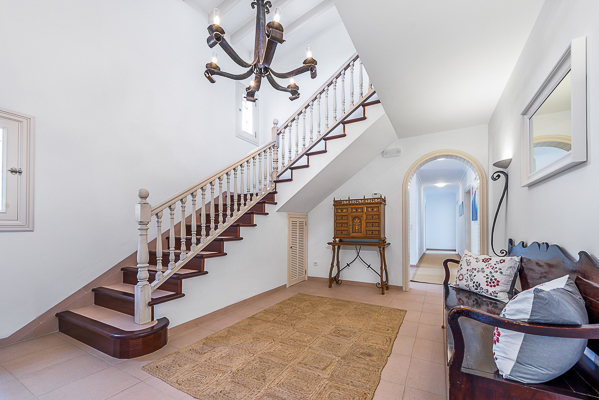 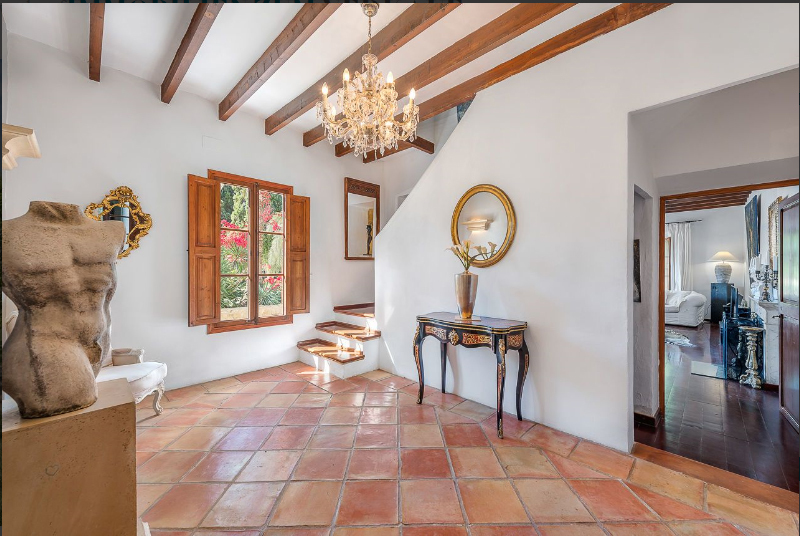 The entrance hall leads into the large, tasteful living room with fireplace, Sat-TV and the white piano wing and large window doors opening onto the terrace. 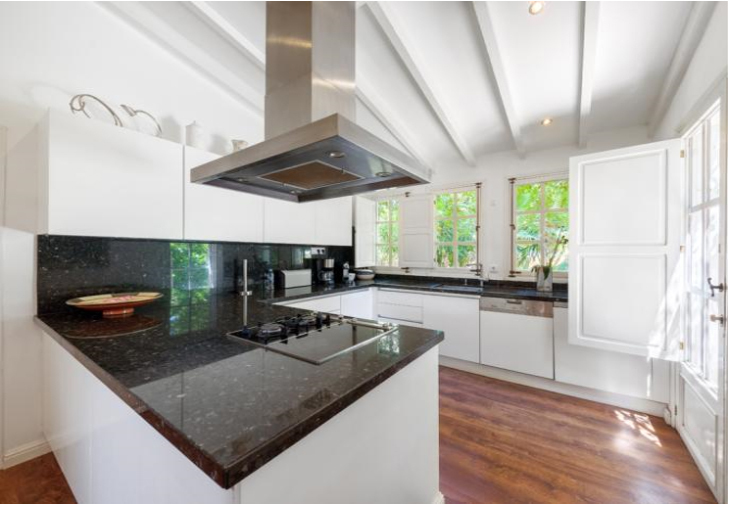 Adjacent lays the large kitchen with pantry, a separate dining room, a guest toilet, and one of the 5 bedrooms with double bed and bathroom en suite. 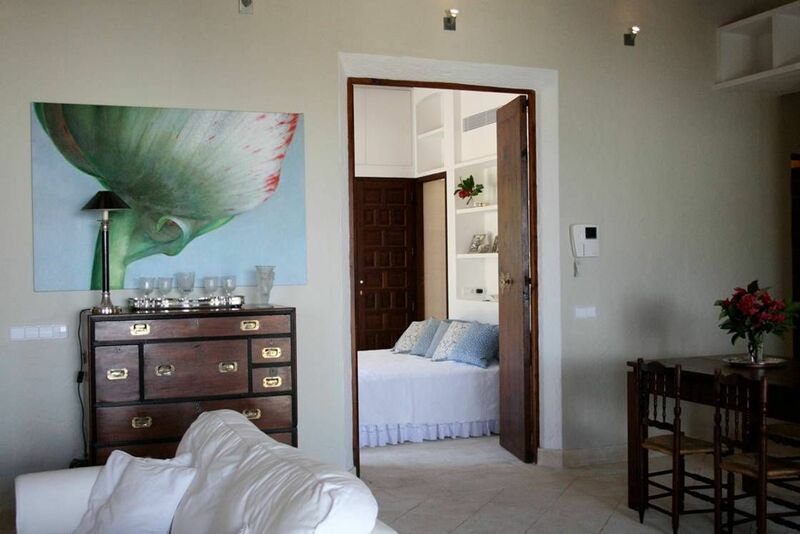 The master bedroom complete with dressing room, bathroom en suite, Sat-TV and access to the terrace is located upstairs, and so are 3 further bedrooms, each with a bathroom en suite. 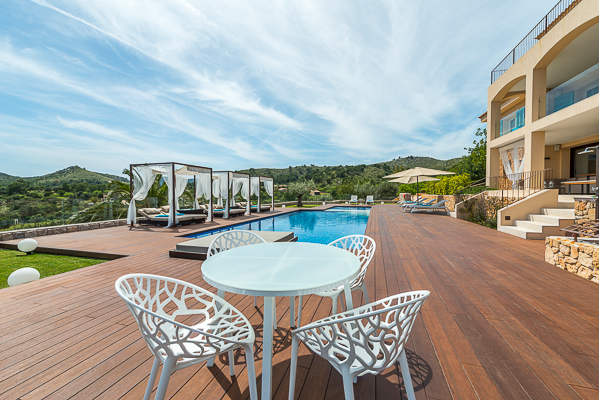 The outdoor entertainment areas include well-furnished sun-exposed and sun-shaded terraces, all with fabulous panoramic views over the picturesque countryside and the sea. 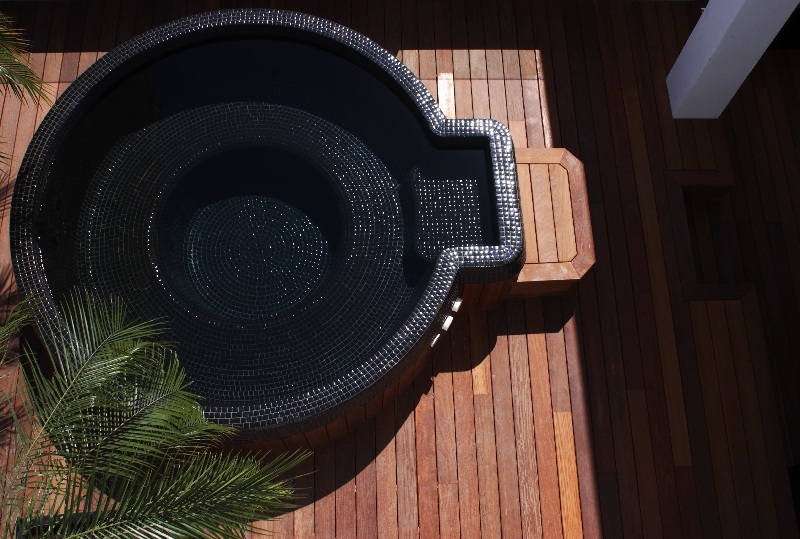 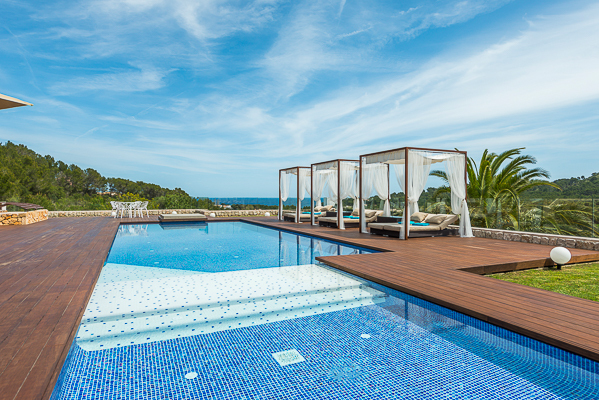 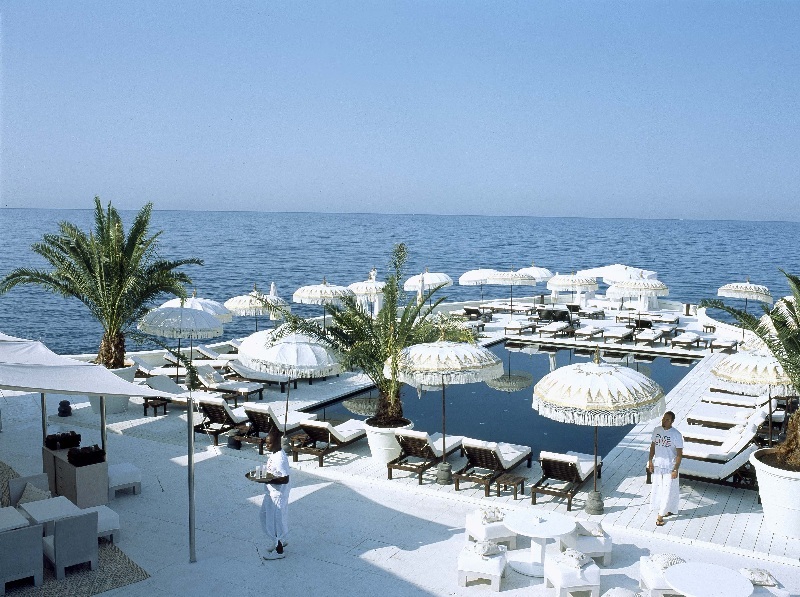 The large swimming pool is accessible via a ladder and it is lined with sun loungers and parasols, inviting the whole family to spend invigorating hours in and off the water. 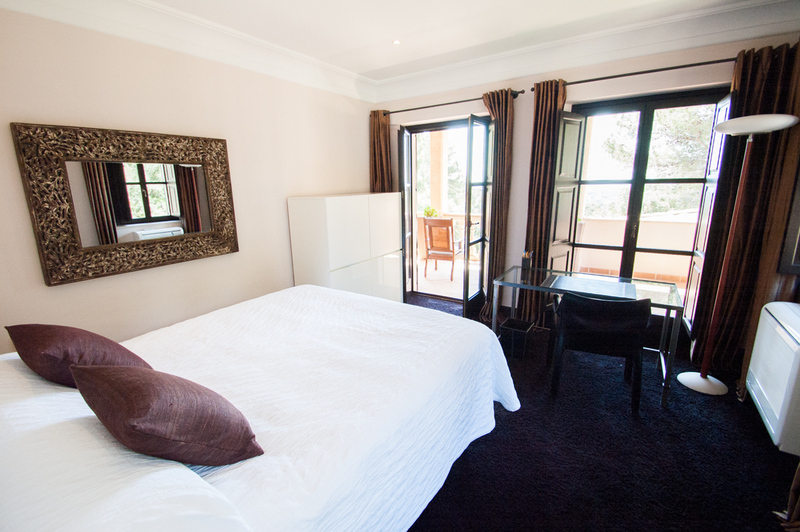 A relaxing and memorable holiday in style and comfort is guaranteed. 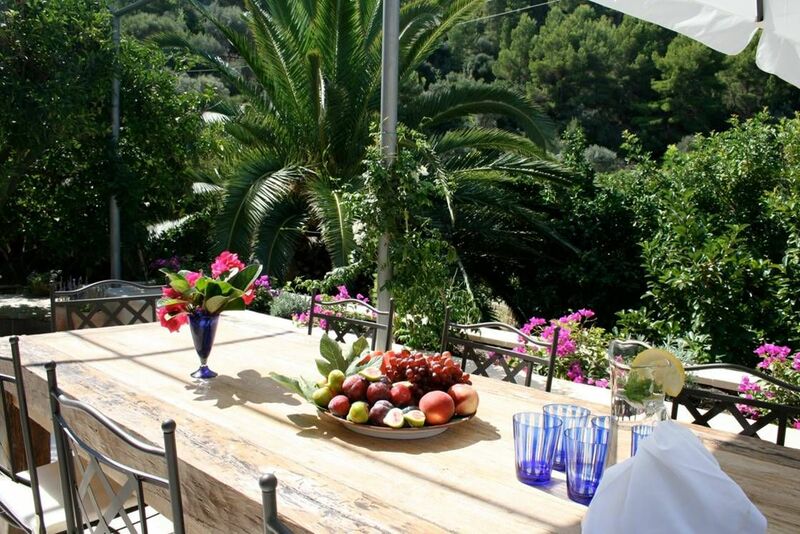 Check-in 16:00 h / check-out 10:00 h Daily breakfast buffet and roomservice between 8am and 12am! 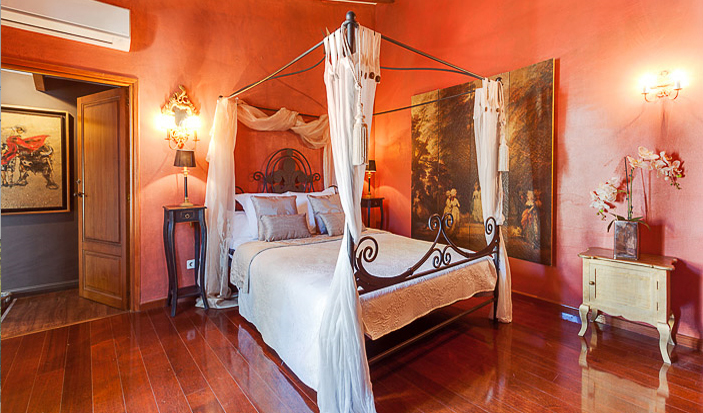 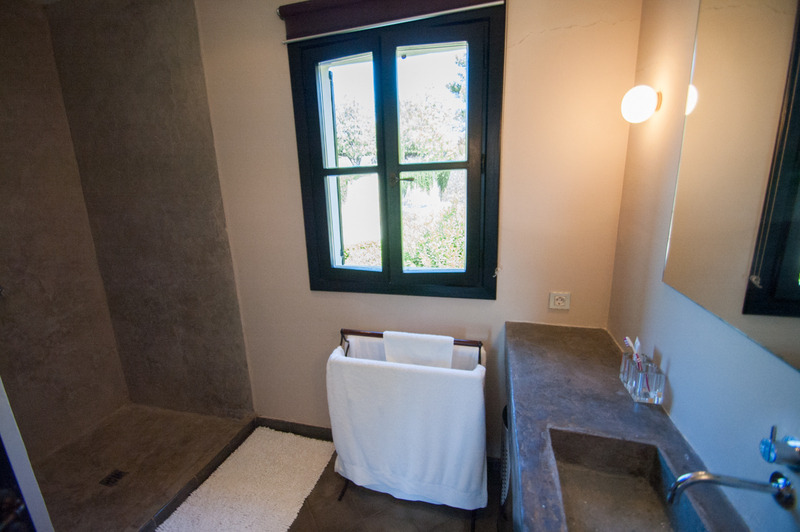 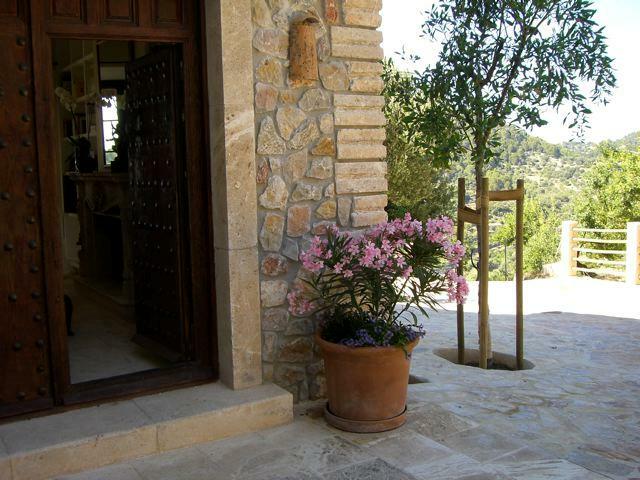 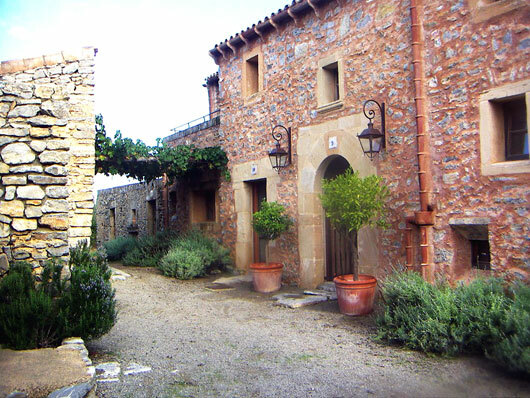 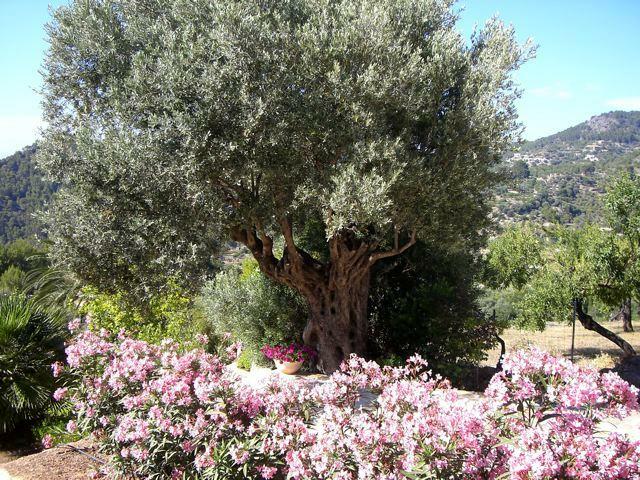 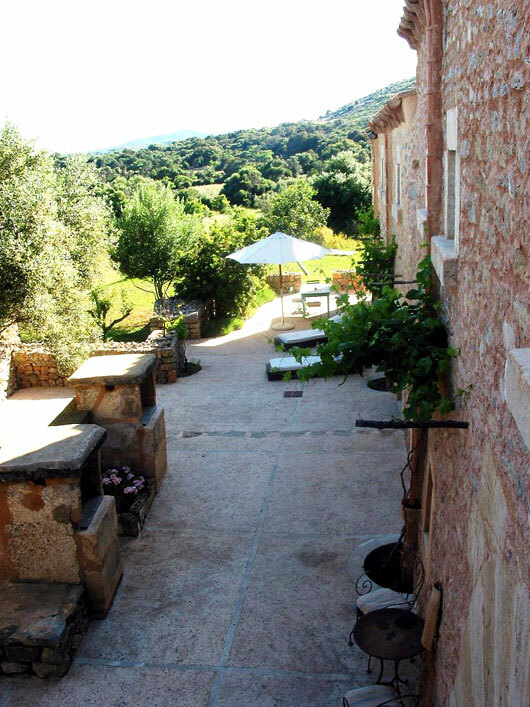 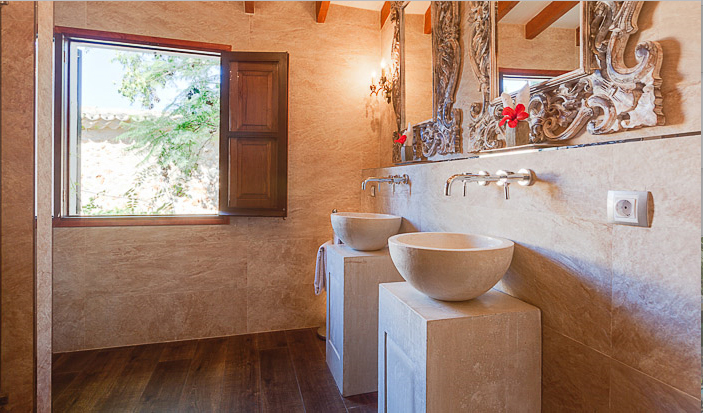 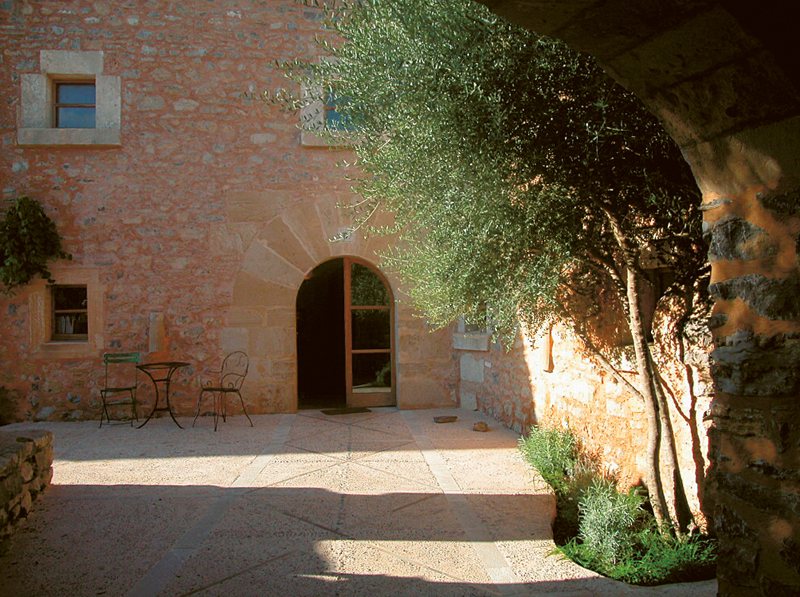 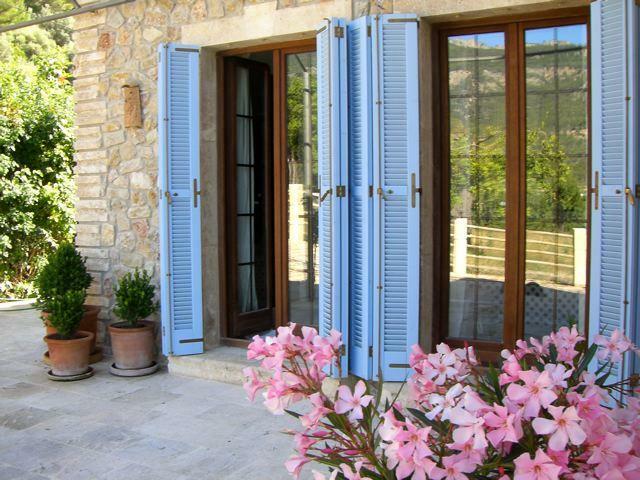 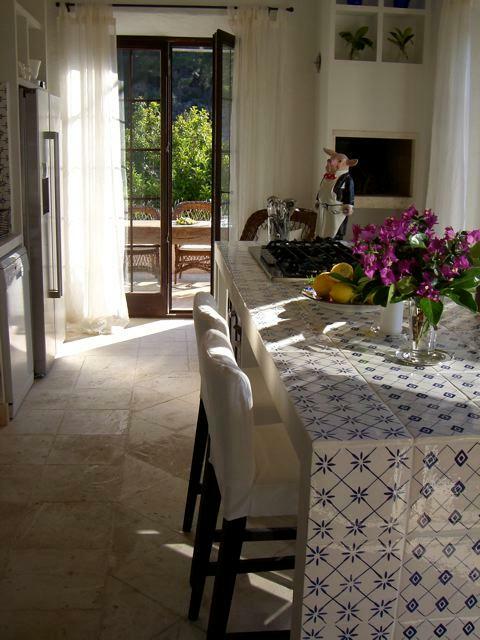 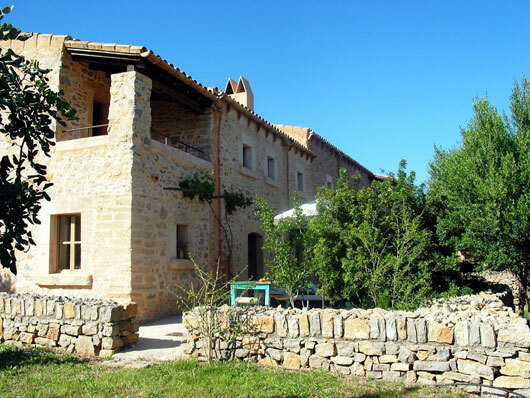 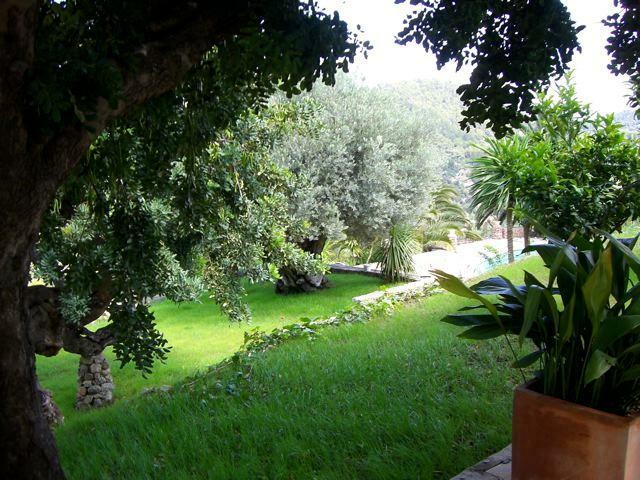 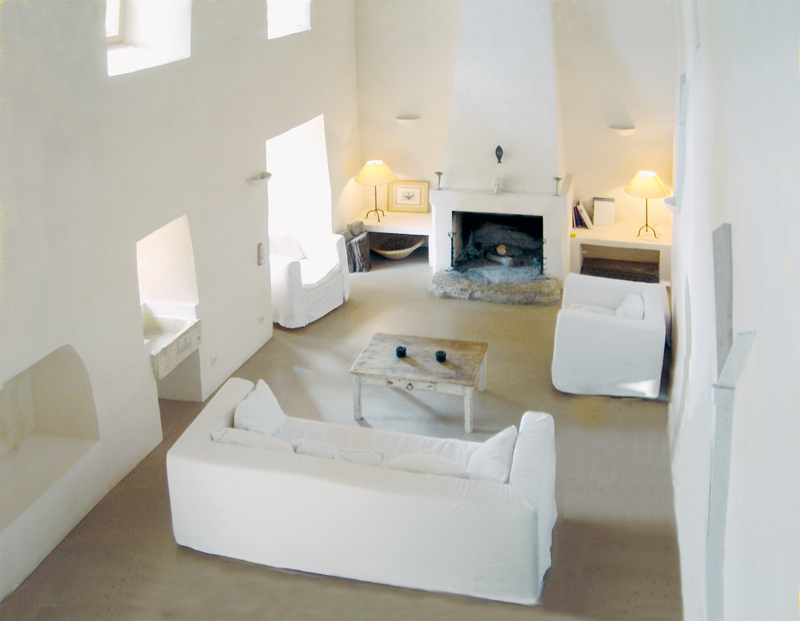 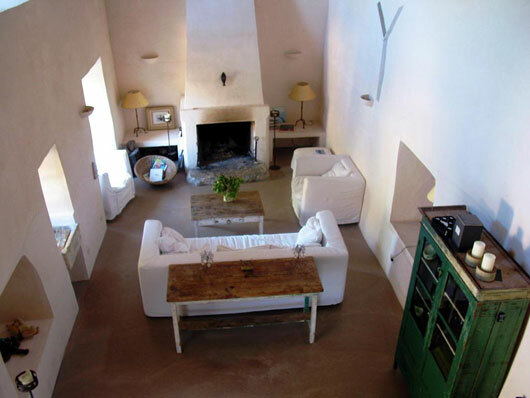 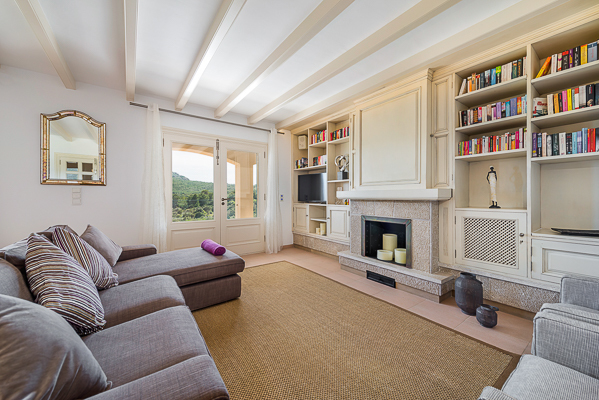 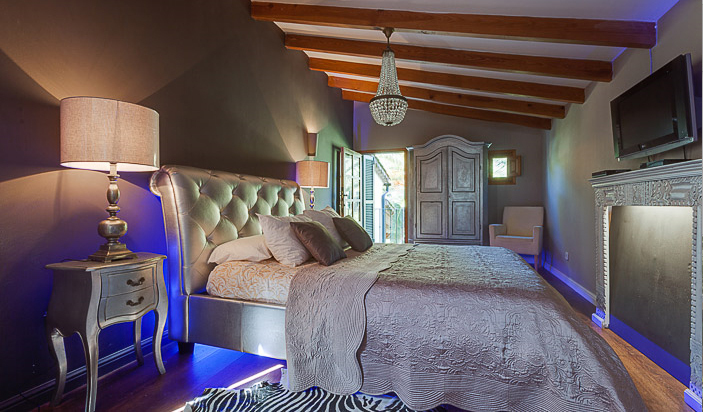 Tres Olivos is a beautiful finca nestled in a picturesque valley above the town of Andratx. 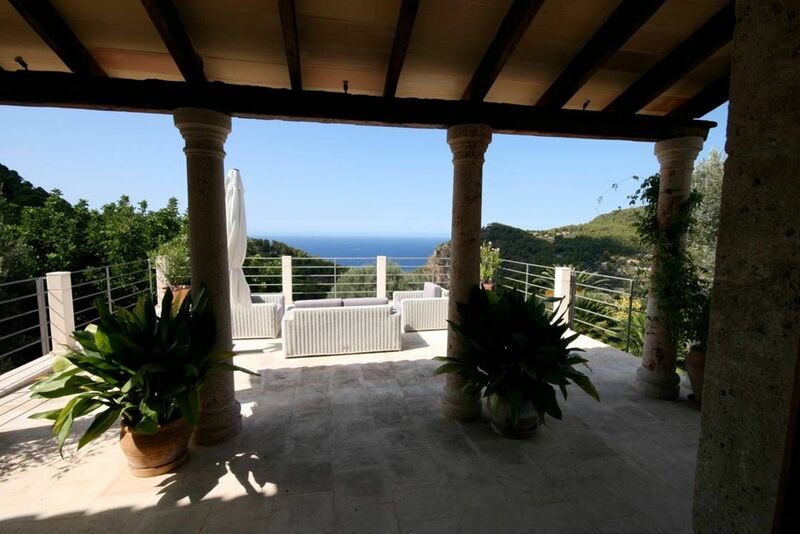 Experience the stunning mountain views and peaceful luxury of this exclusive property, which provides the utmost privacy. 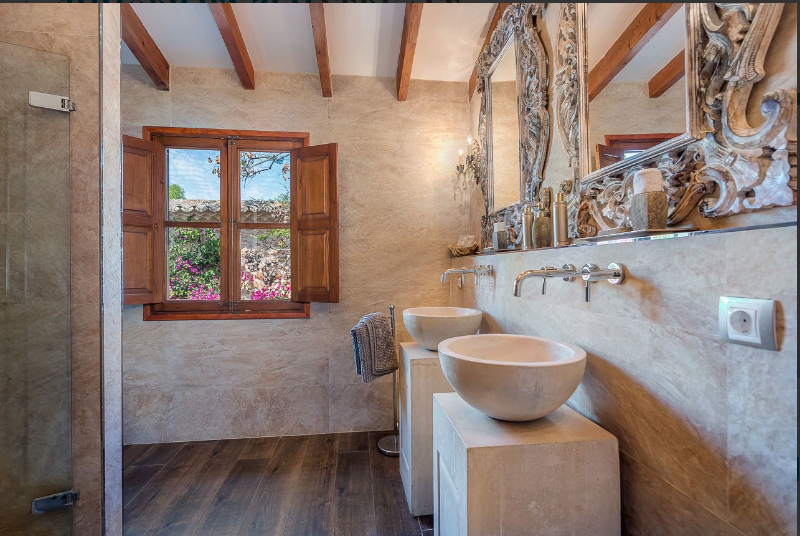 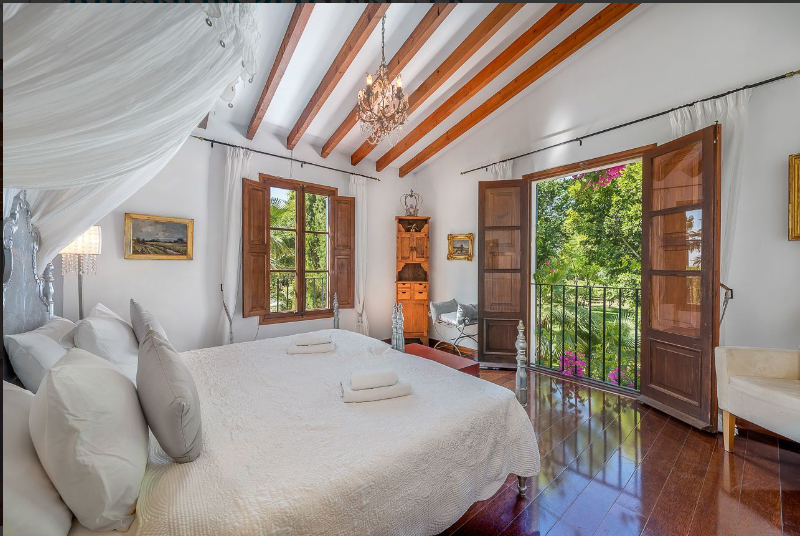 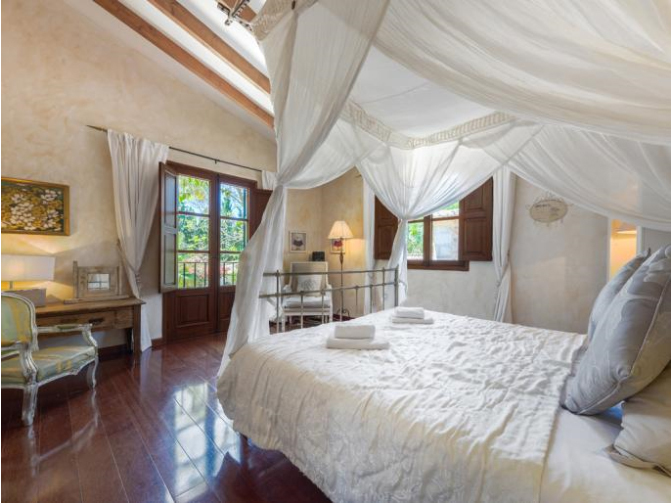 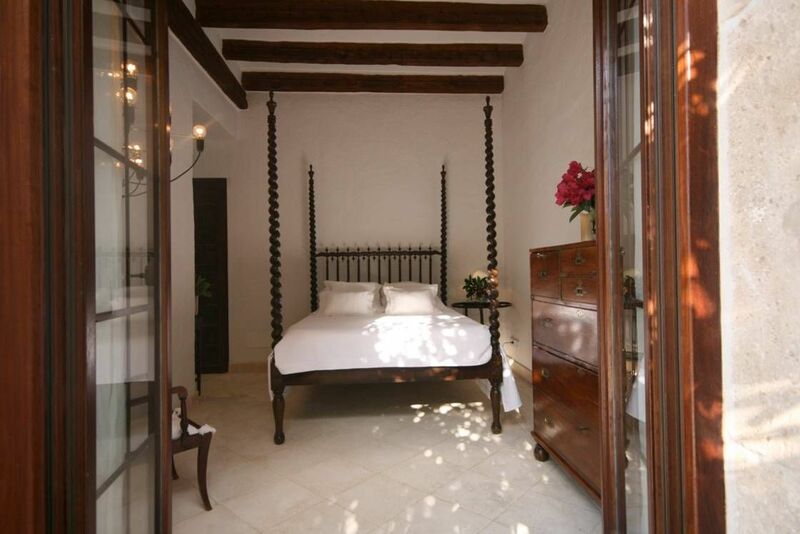 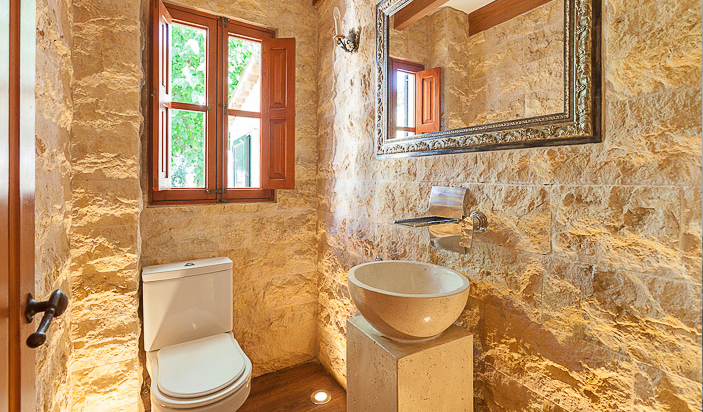 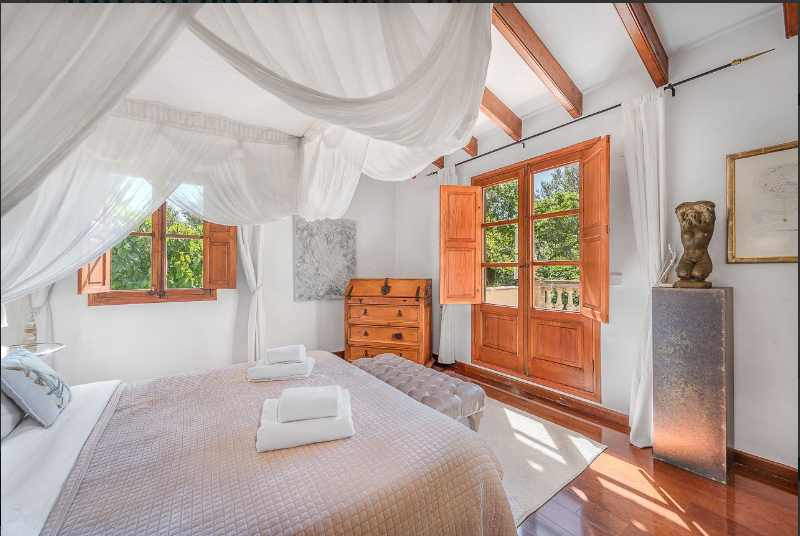 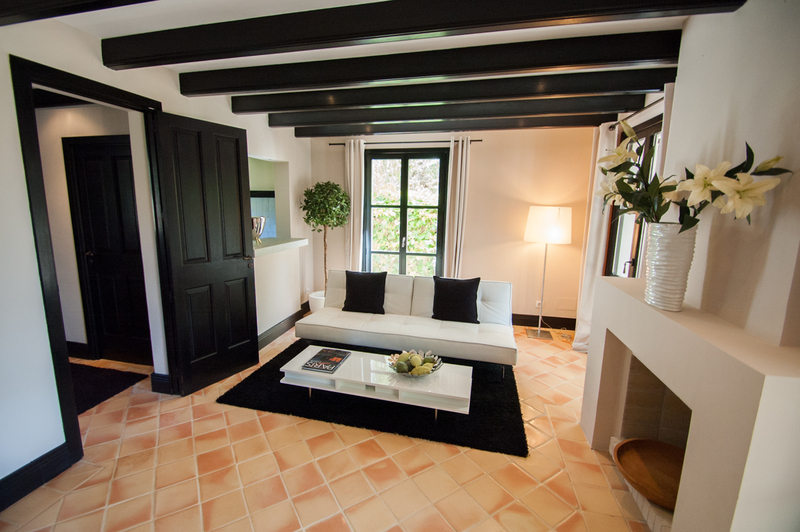 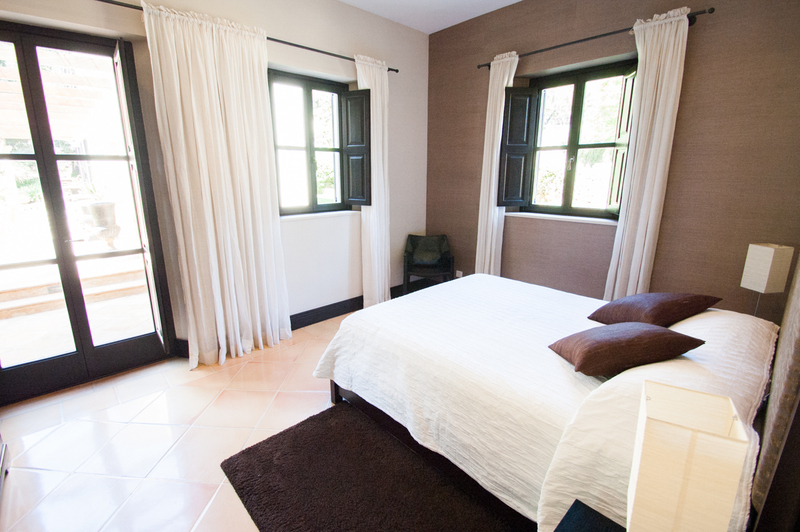 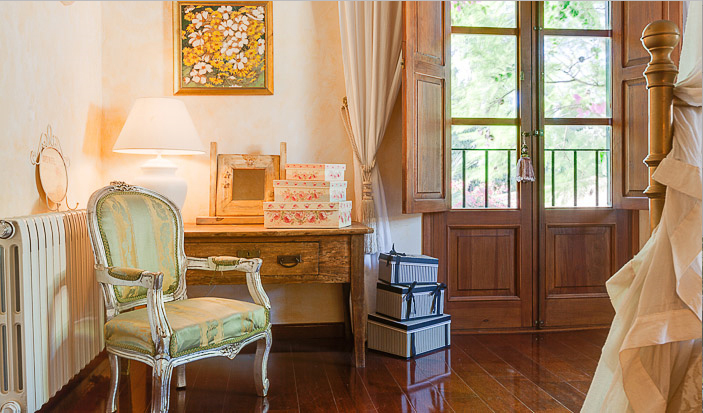 The recently renovated finca boasts stylish interior design throughout, as well as maintaining many of its original features, and is suitable for everyone, including families. 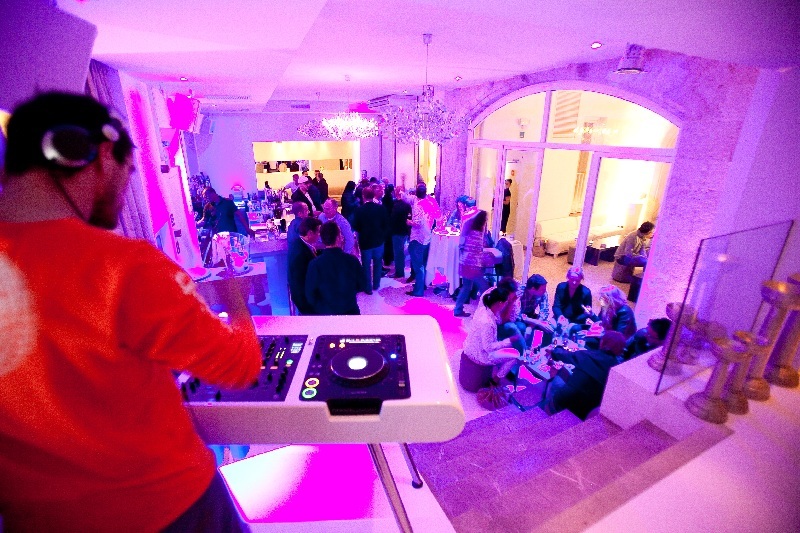 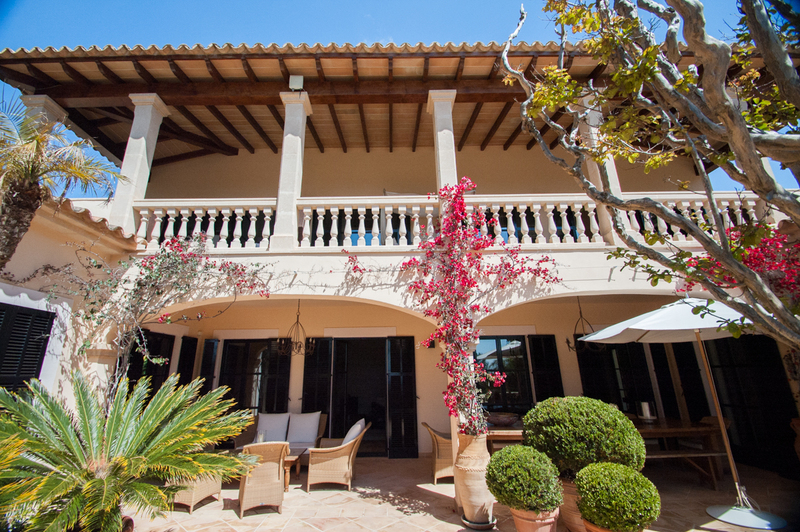 The sizable outdoors area and patio of Tres Olivos provides a great location for entertaining, be it a large party or casual barbeque, and the open-plan ground floor, fitted with a state-of-the-art Sonos sound system, makes it easy for everyone to flow through to the bar in the evening. 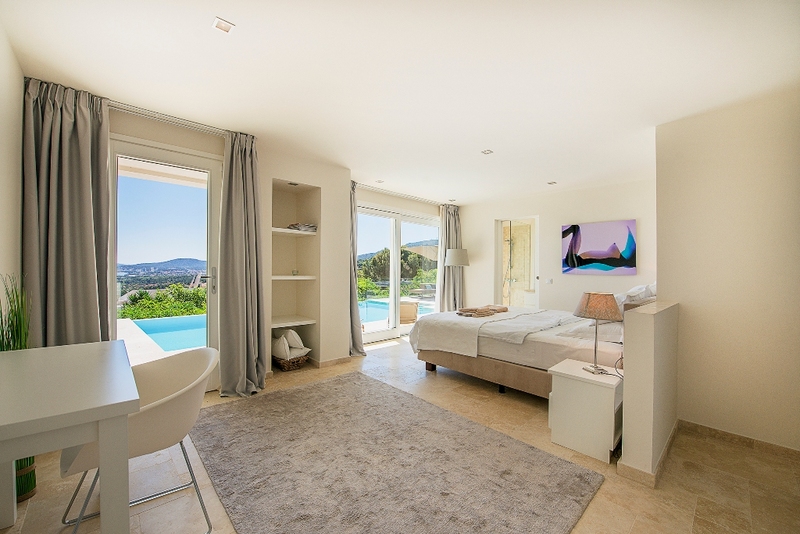 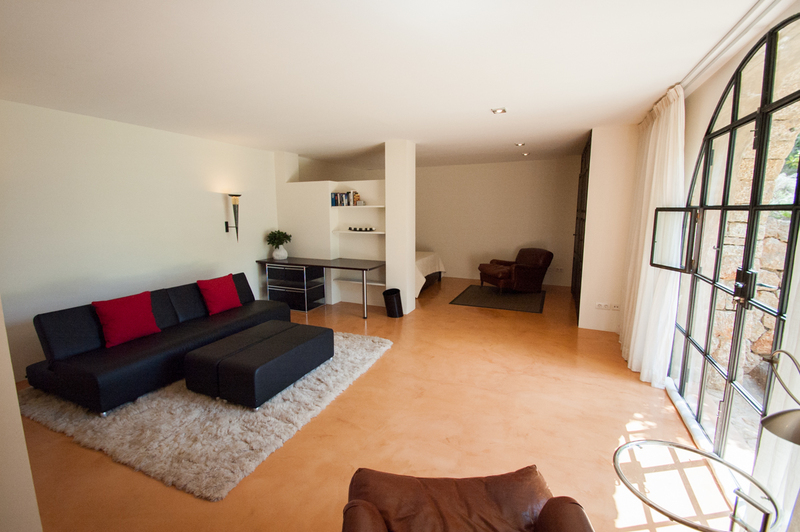 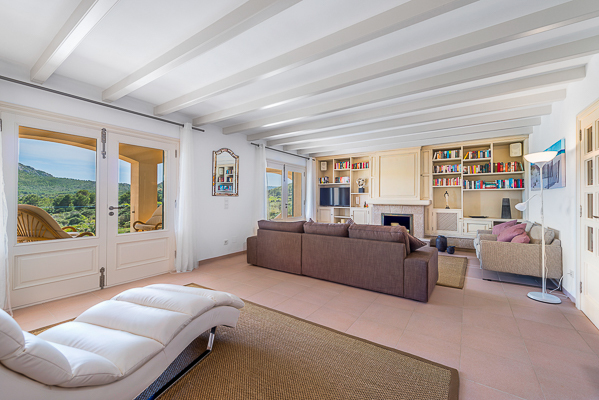 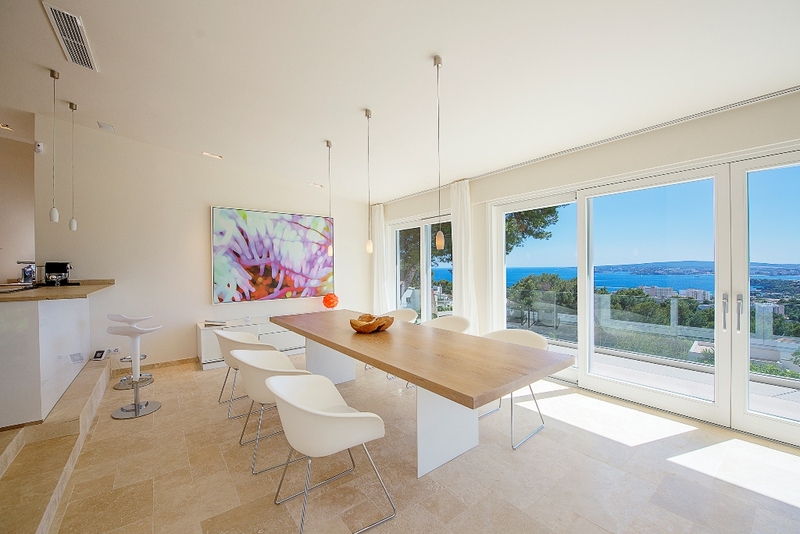 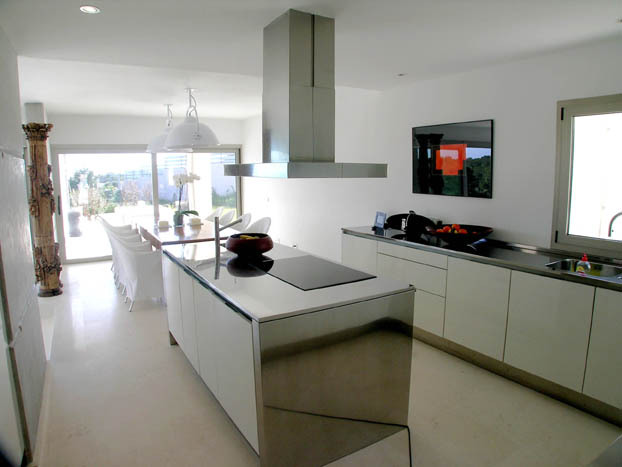 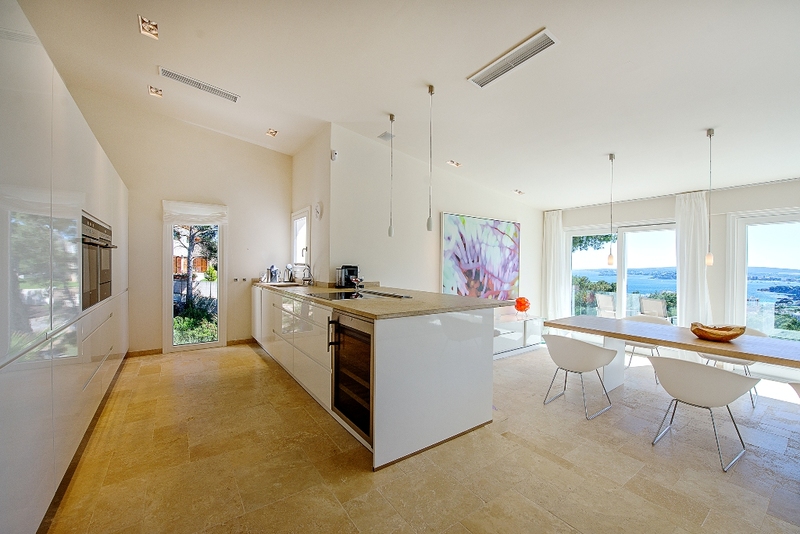 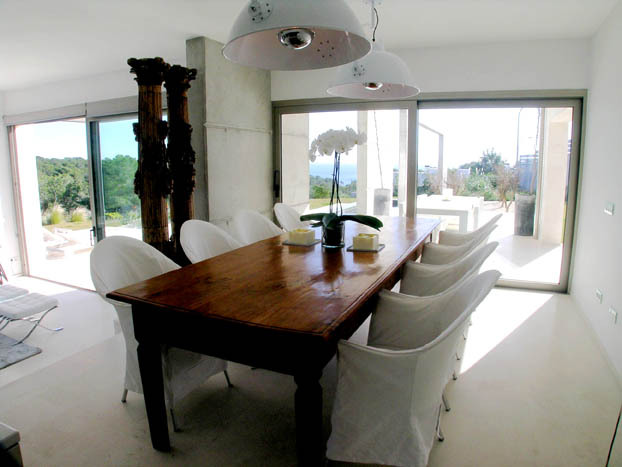 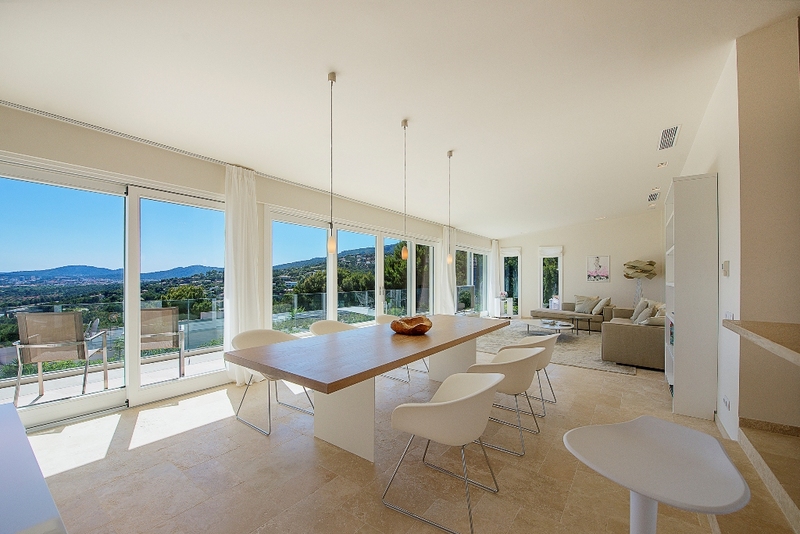 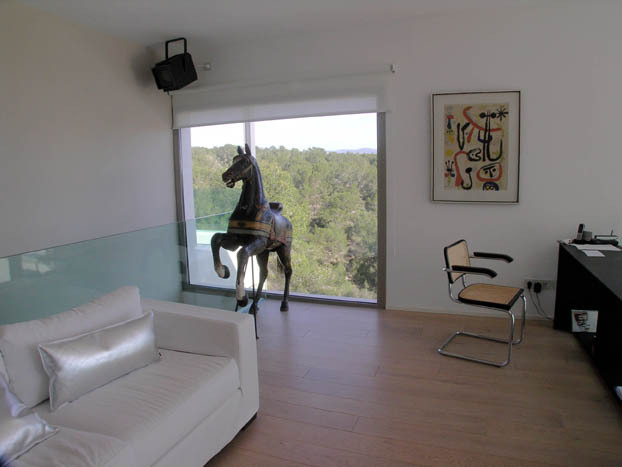 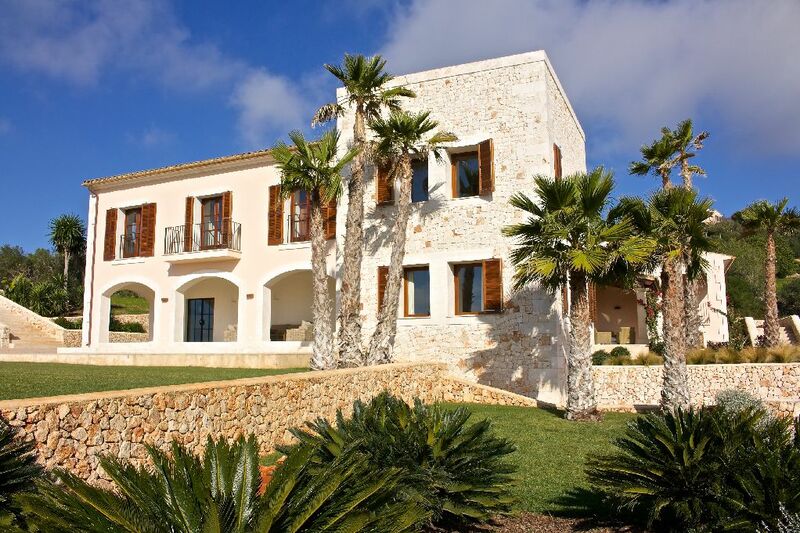 The modern Villa Falco II nestles peacefully on a hill within the privileged residential resort „Sol de Mallorca“. 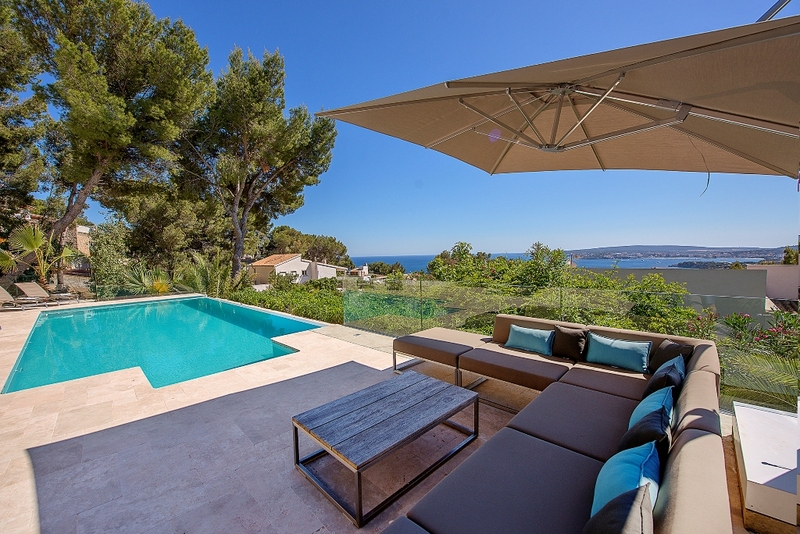 Just as the sister villa Cap Falco on the neighboring property, it boasts fabulous sea views across the whole Bay of Palma. 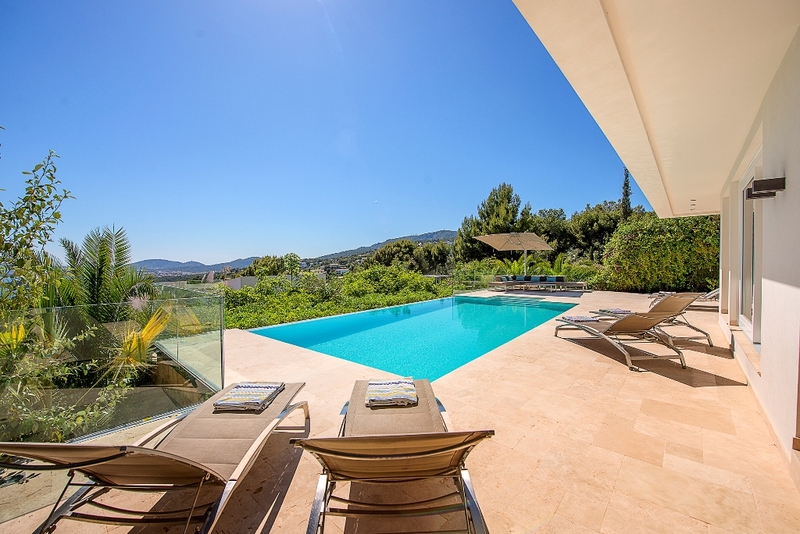 The stunning Villa Es Serral enjoys an absolutely privileged location: Nestling on a gentle hill and overlooking the sea, the huge Park-like garden grounds provide for maximum privacy and tranquility, while the vibrant city of Palma and its countless leisure options are just a stone´s throw away. 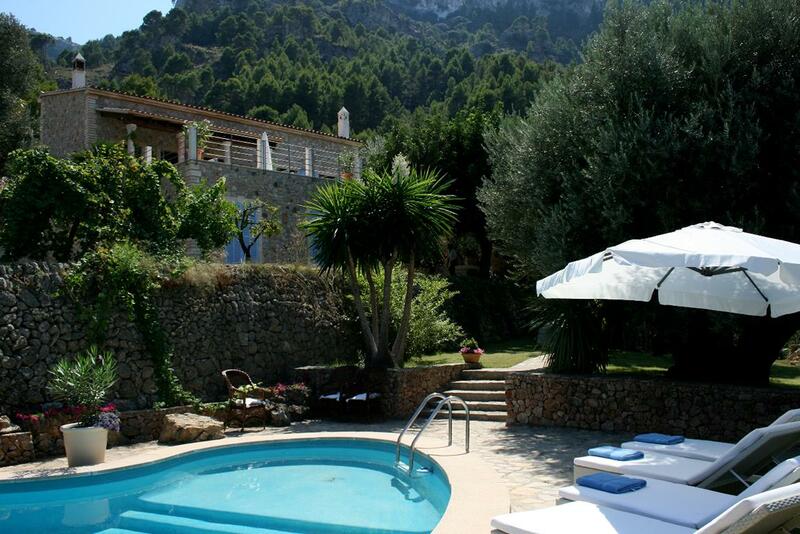 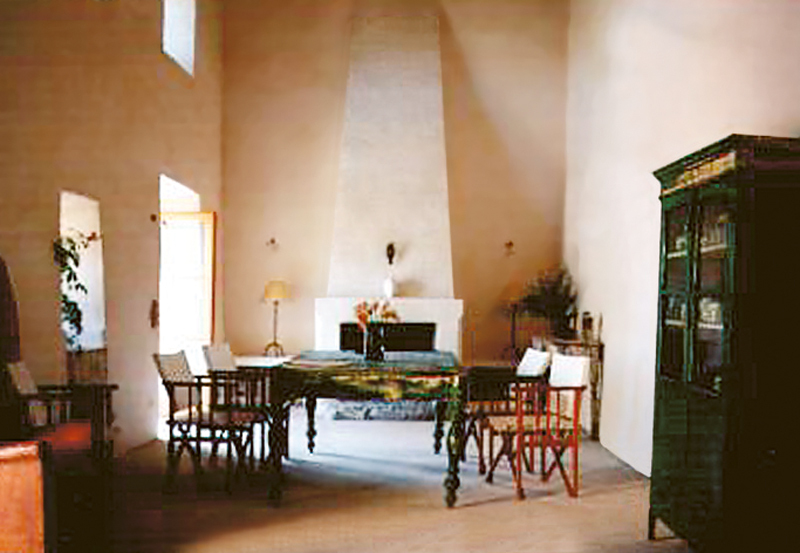 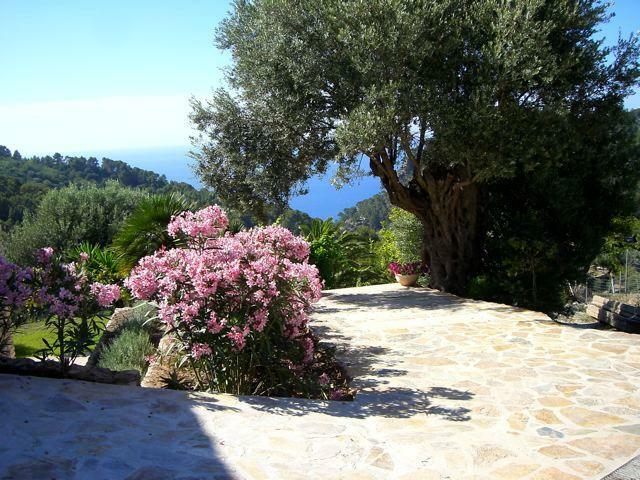 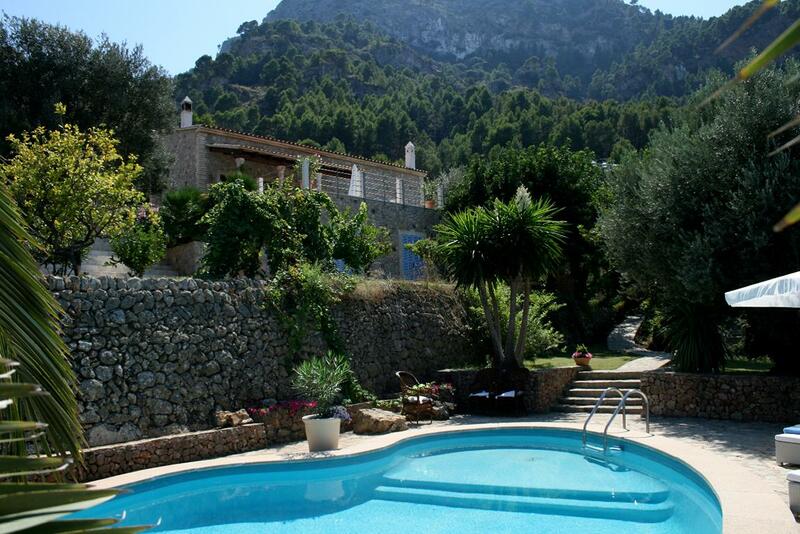 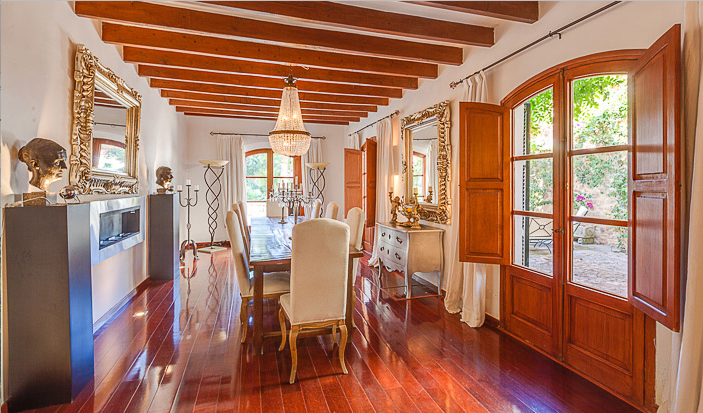 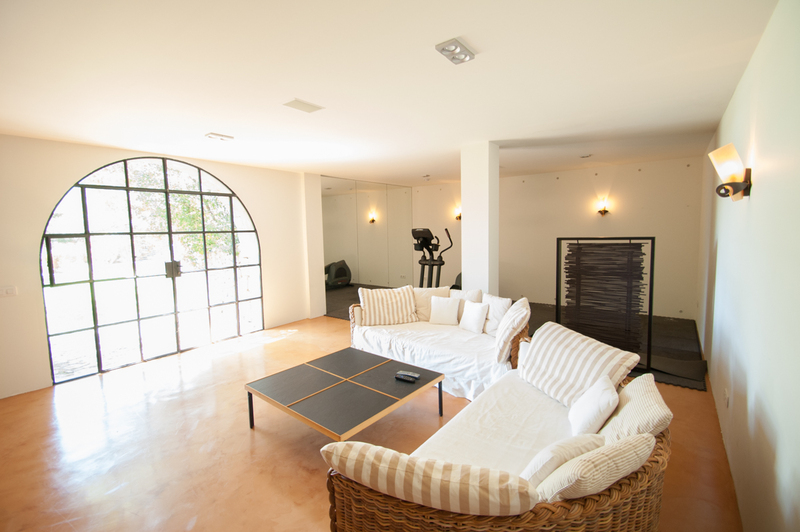 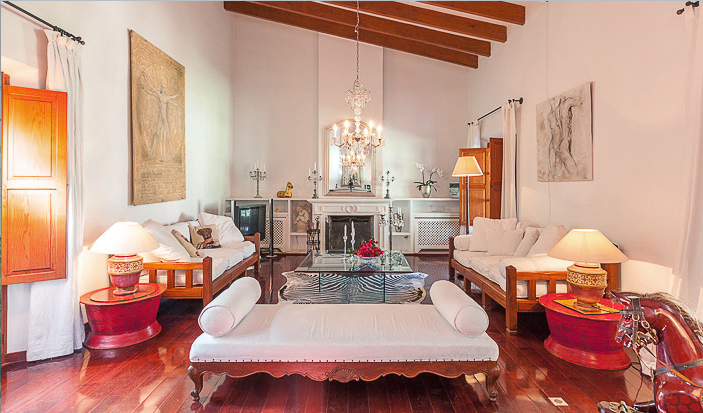 Like an eagle´s nest this elegant finca lies enthroned on the slopes of Tramuntana mountains high above the ocean. 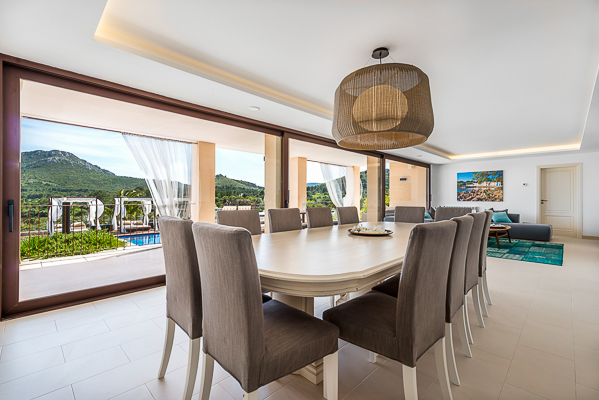 Spectacular views across the deep blue sea and the picturesque village of Banyalbufar unfold from this privileged and rare location. 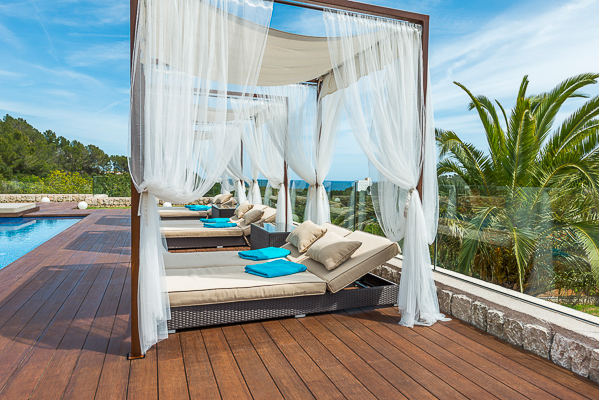 In the evening enjoy unforgettable sun sets from your terrace. 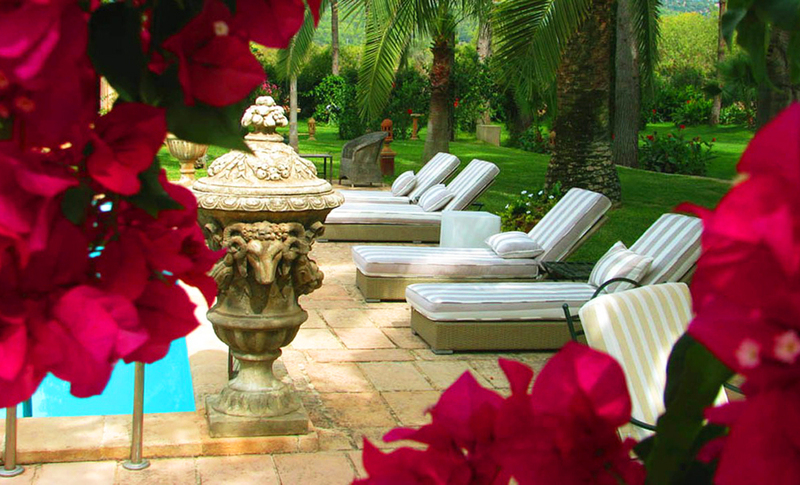 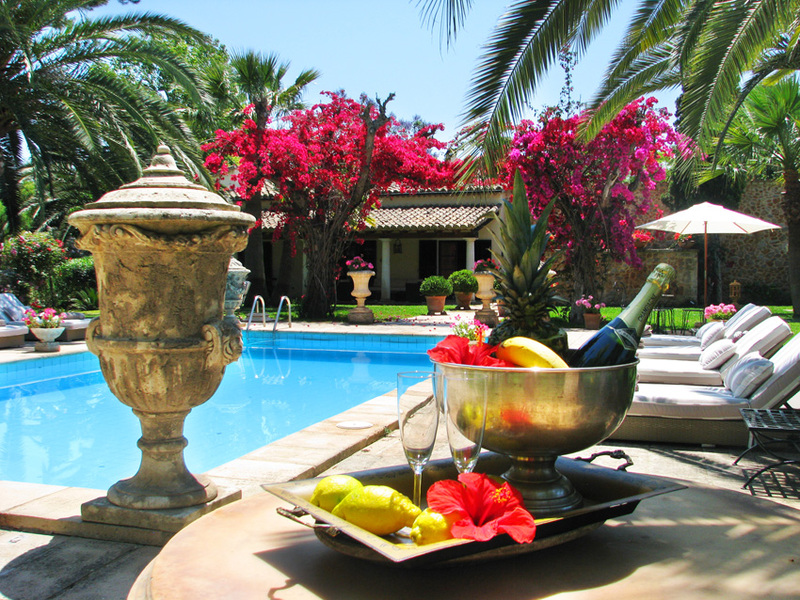 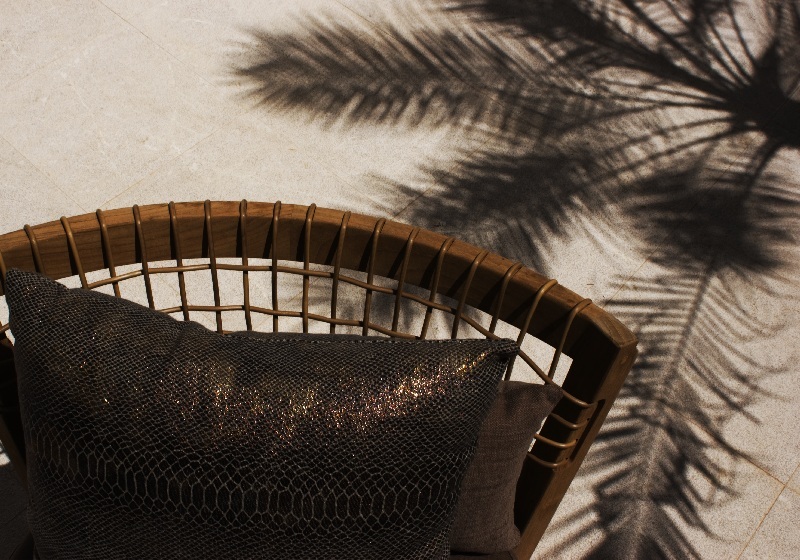 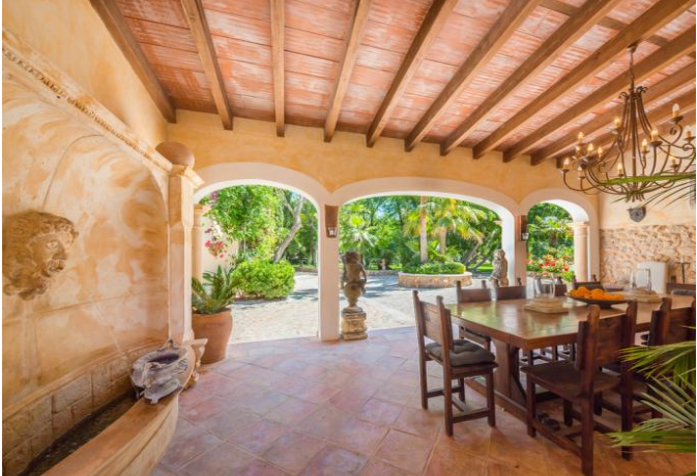 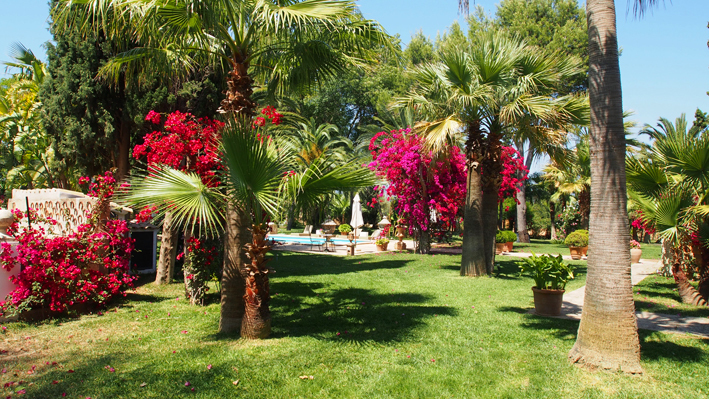 The Villa lays peacefully embedded in a well-tended garden with palm trees, offering soothing shade on hot summer days. 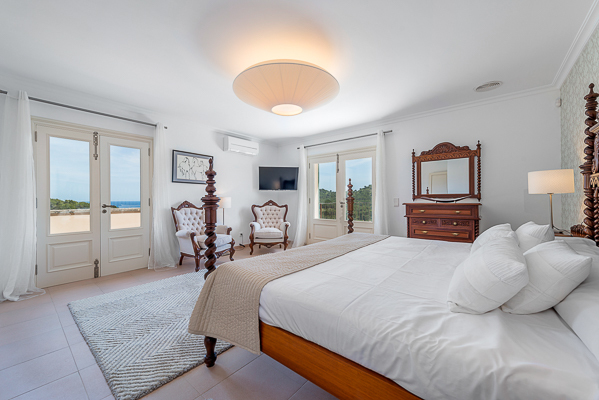 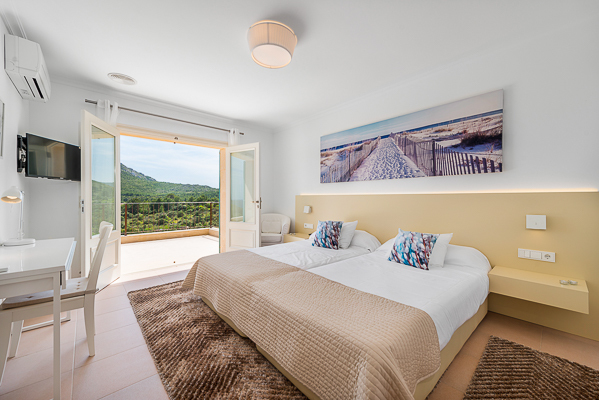 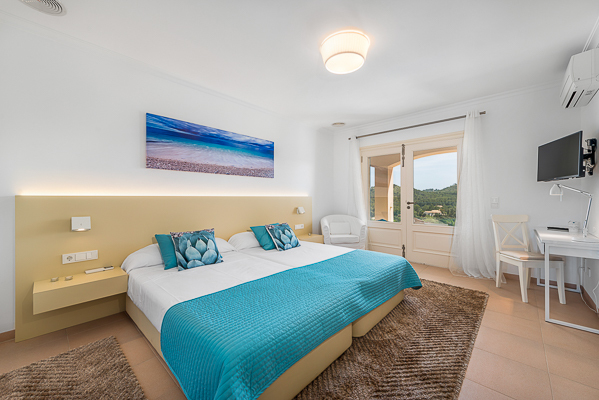 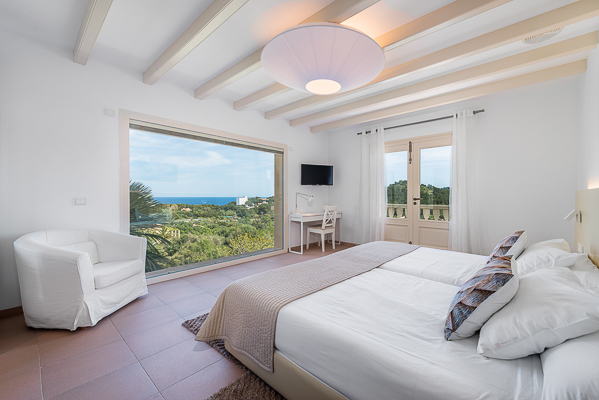 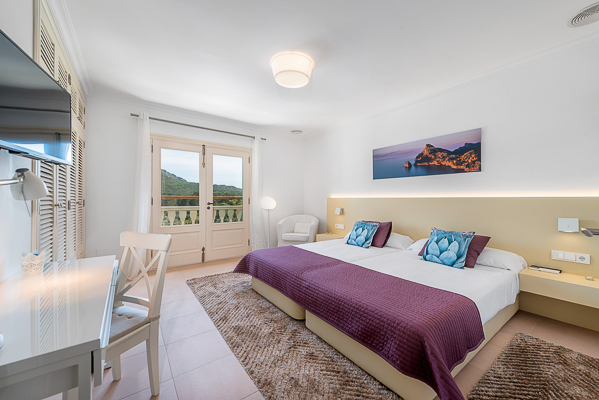 All rooms are on one level, so the Villa is perfectly suited for families with small children and for elderly people, who prefer a holiday home without steps and staircases. 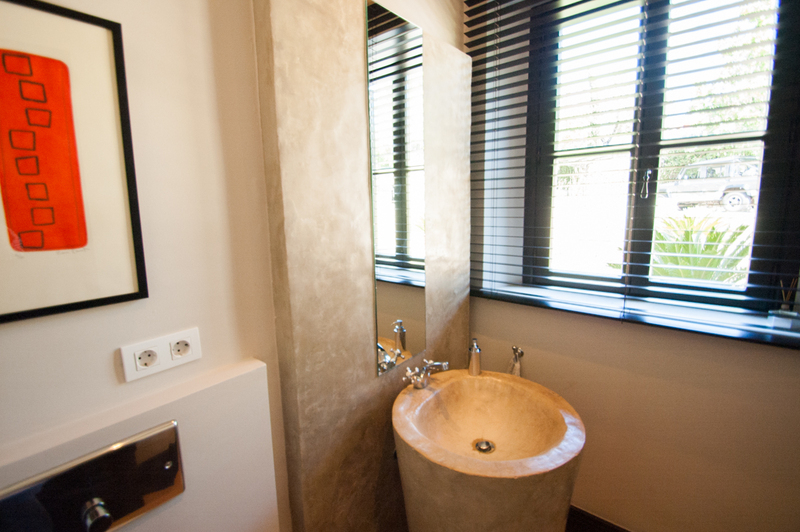 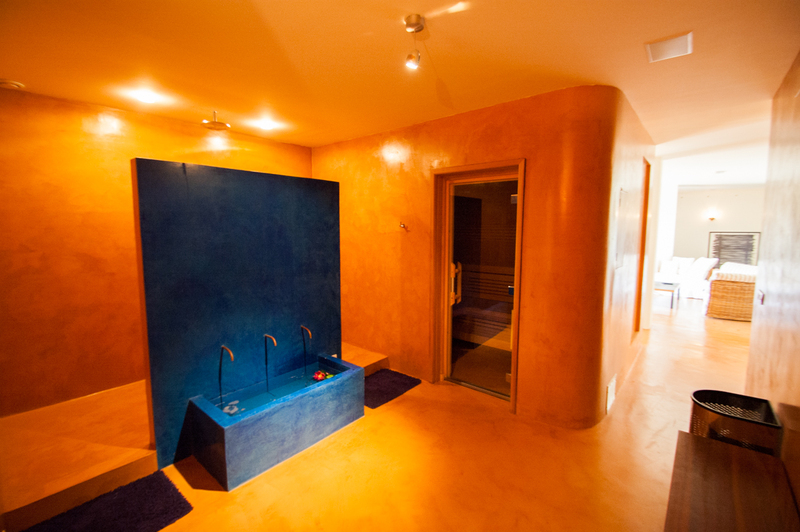 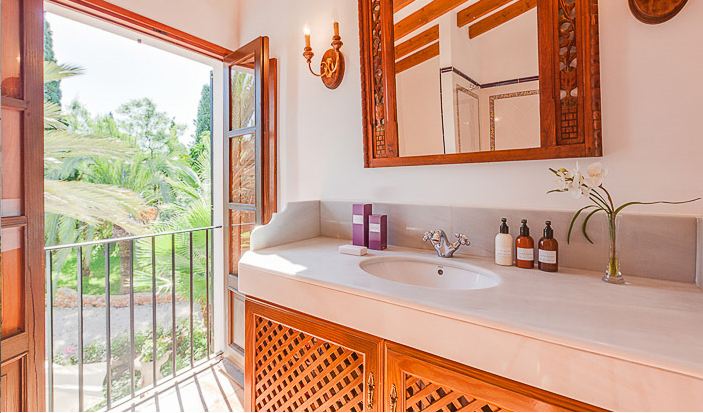 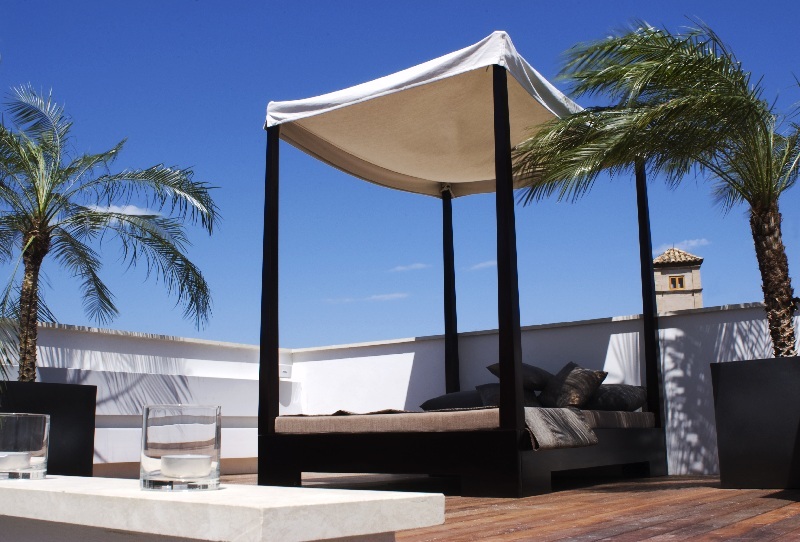 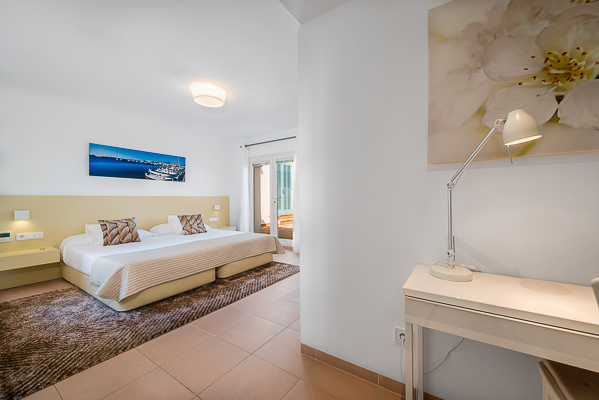 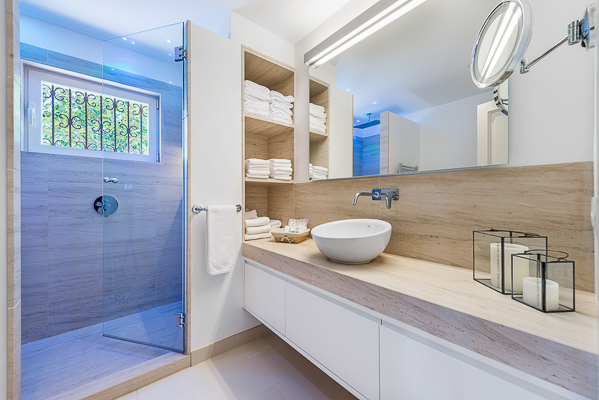 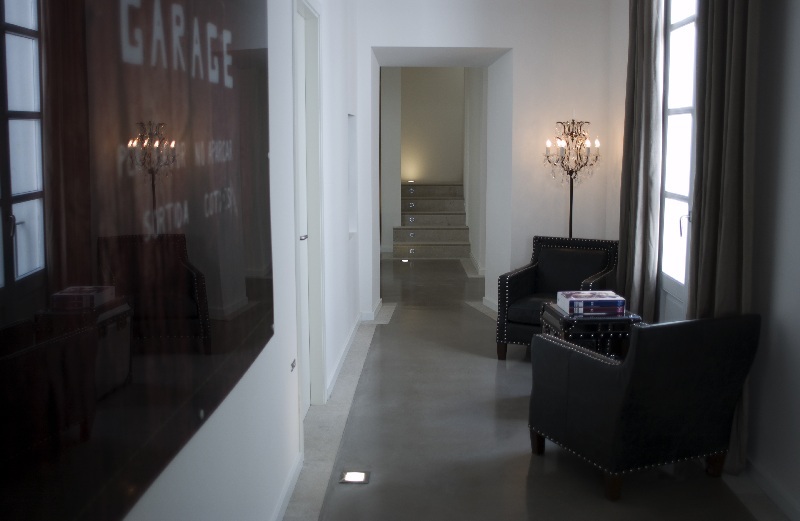 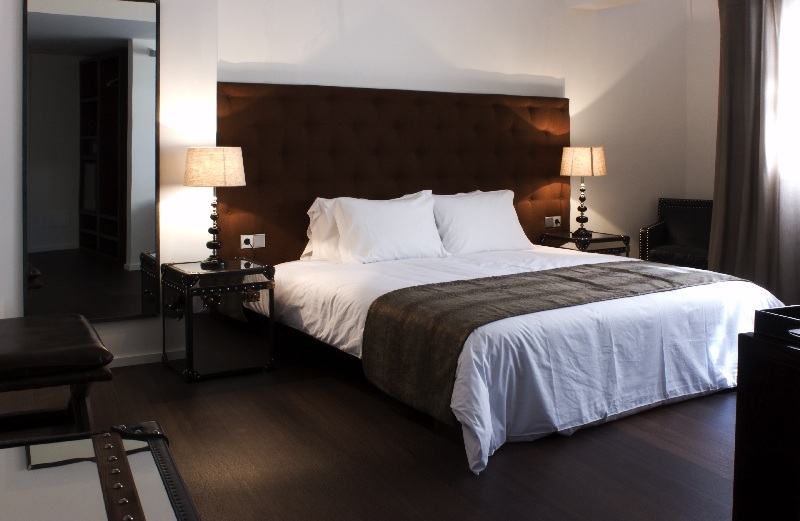 The "Puro Private Wing" is a luxuriously refurbished city palace located in opposite of Puro Hotel in the old city district of Palma. 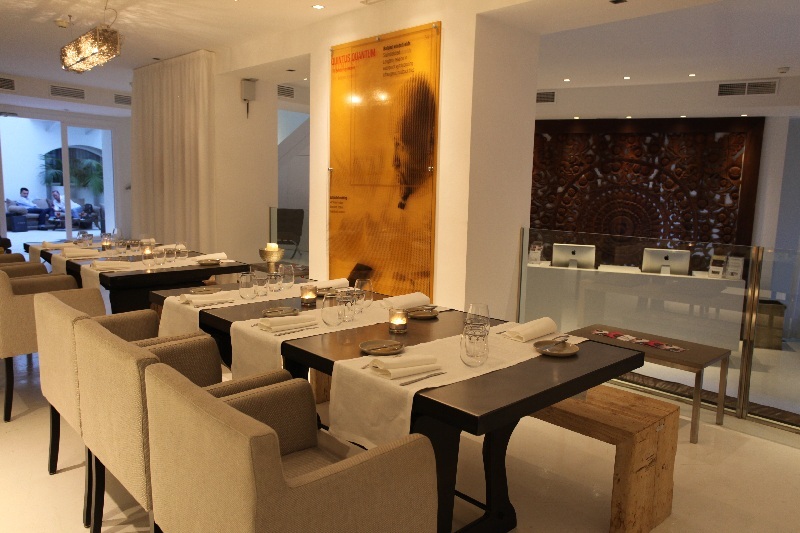 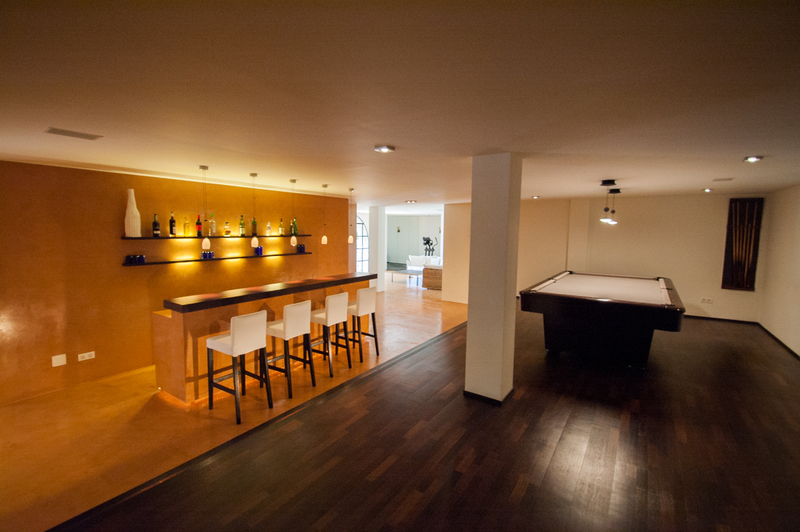 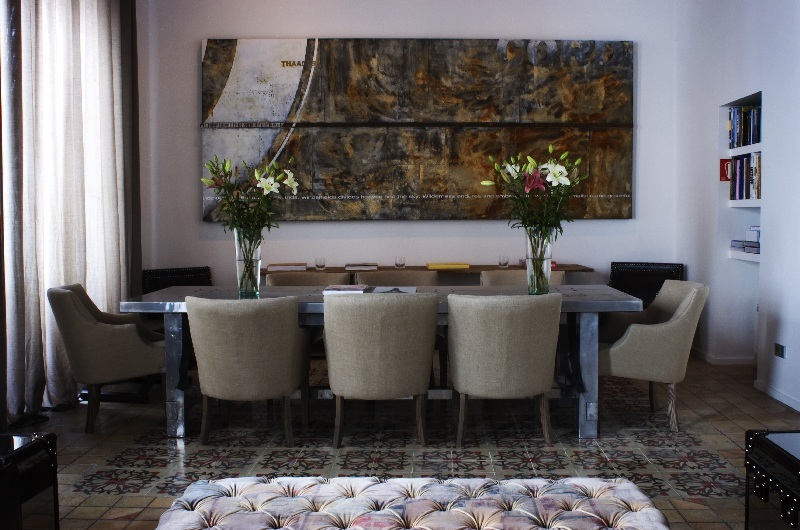 The venue caters for family gatherings or private celebrations as well as for business functions and meetings. 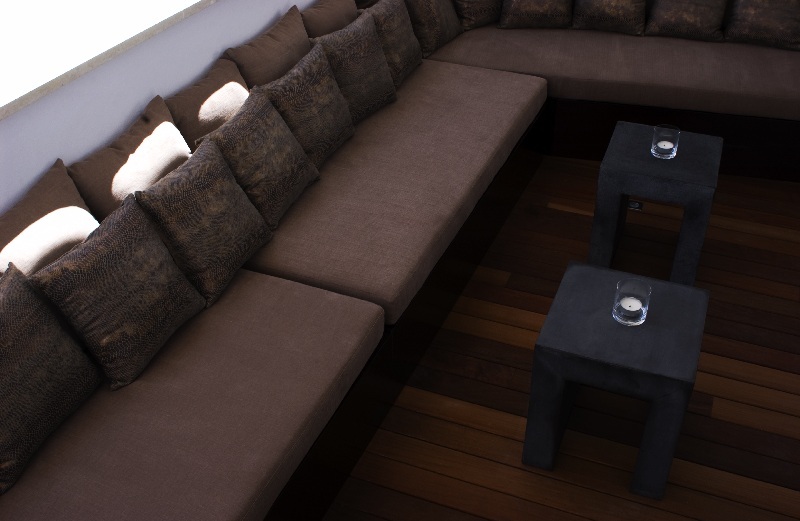 The laid-back, ethnic graced and urban chic atmosphere enchants most discerning guests. 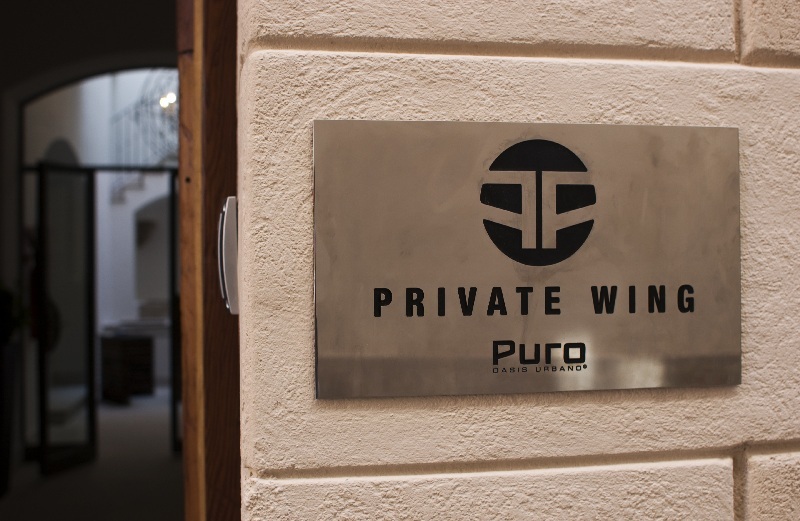 Other conveniences include the 24-hour concierge service, the excellent PURO Restaurant next door including the PURO Opio Bar, a popular meeting place for hip party people and the free shuttle bus to PURO Beach. 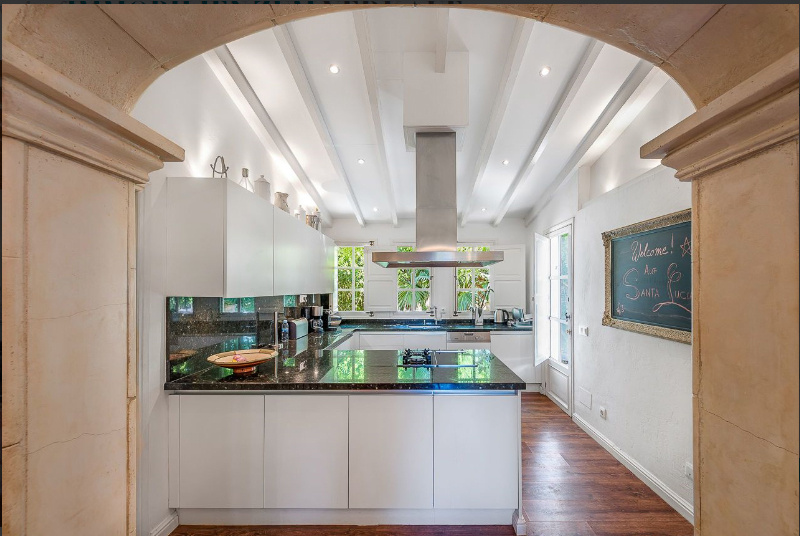 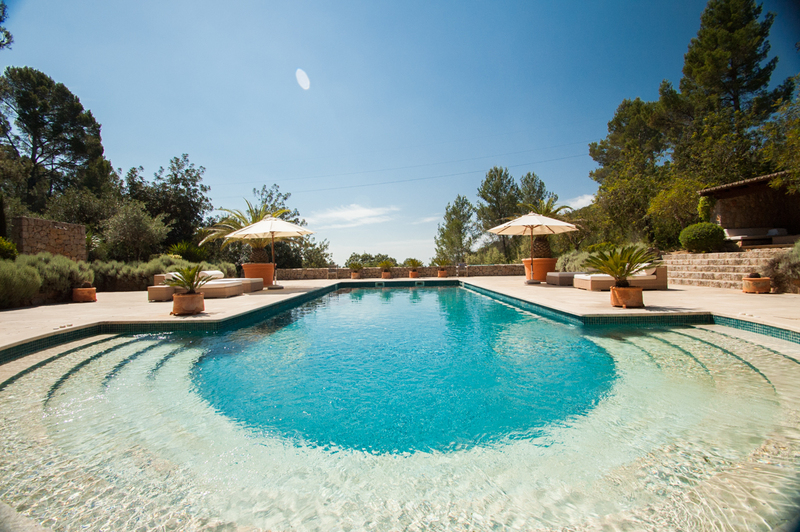 Finca Son Sylvestre is a contemporary, elegant country home on a large property with lush vegetation and a convenient 5 minute drive to Santanyi. 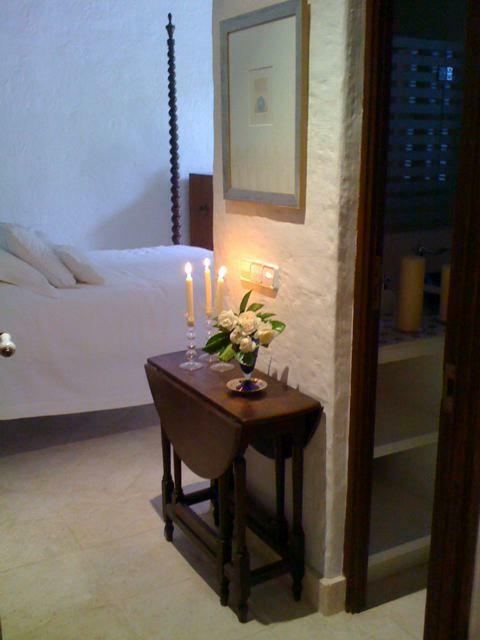 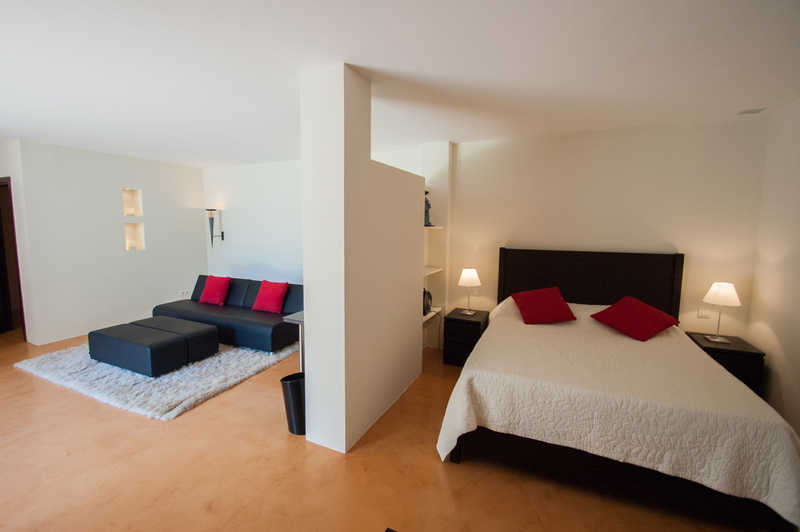 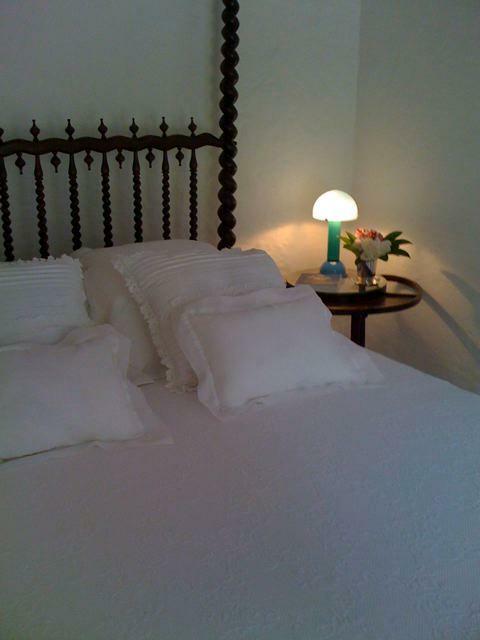 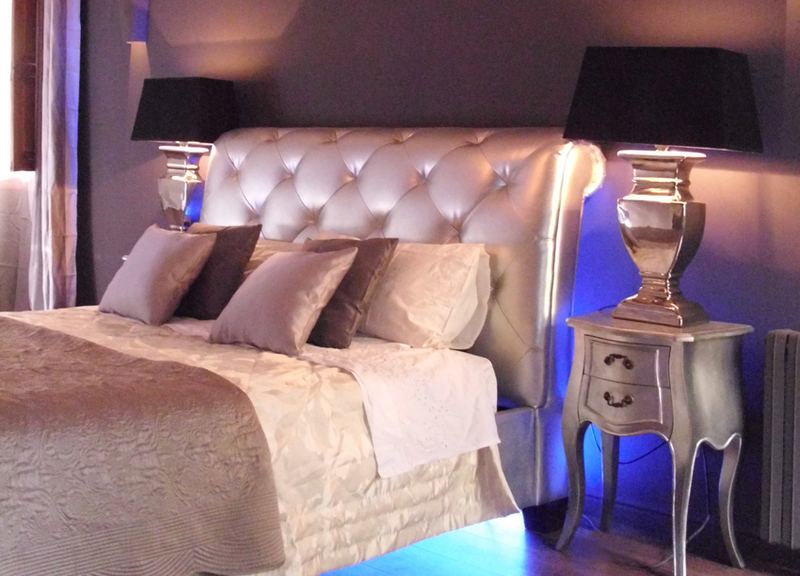 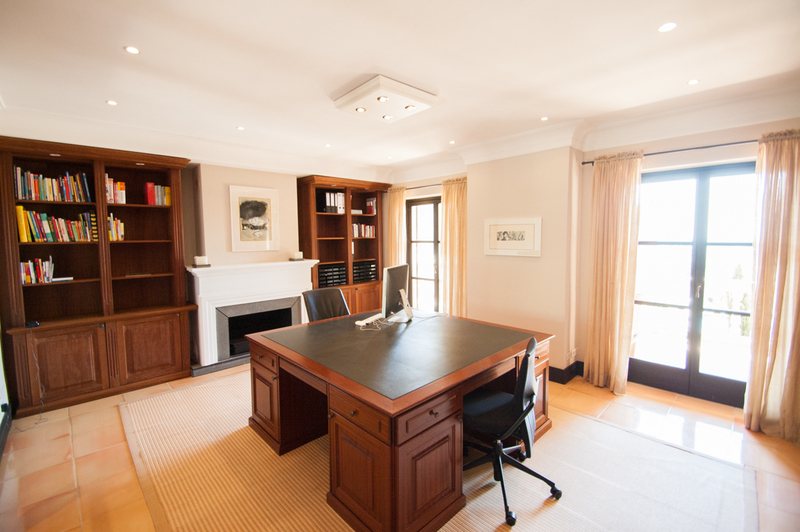 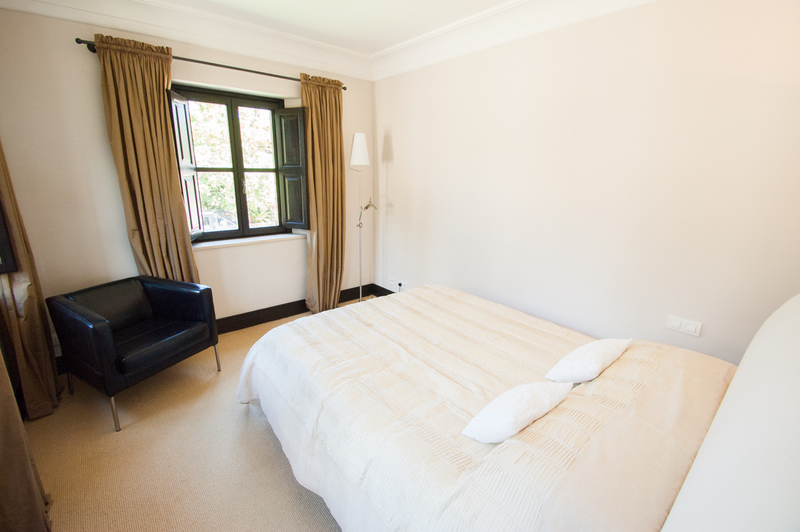 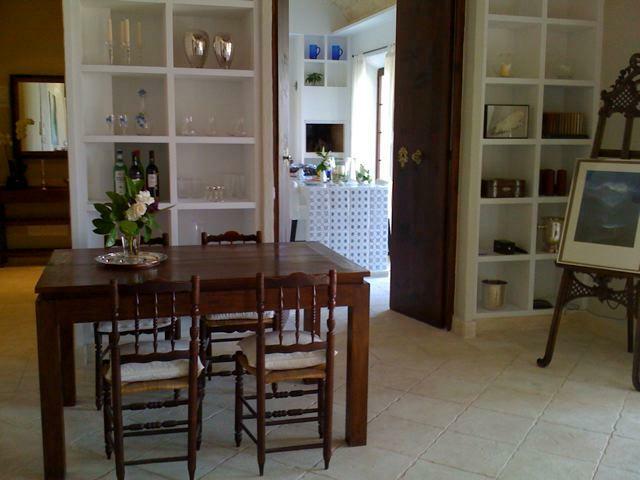 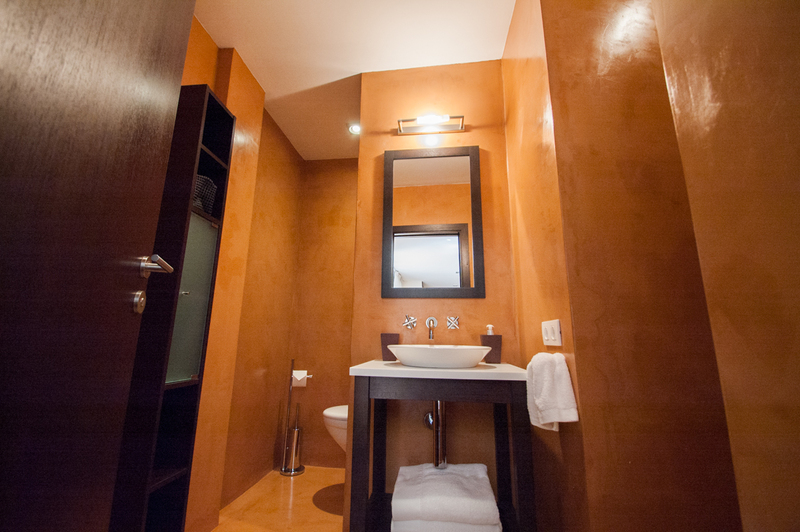 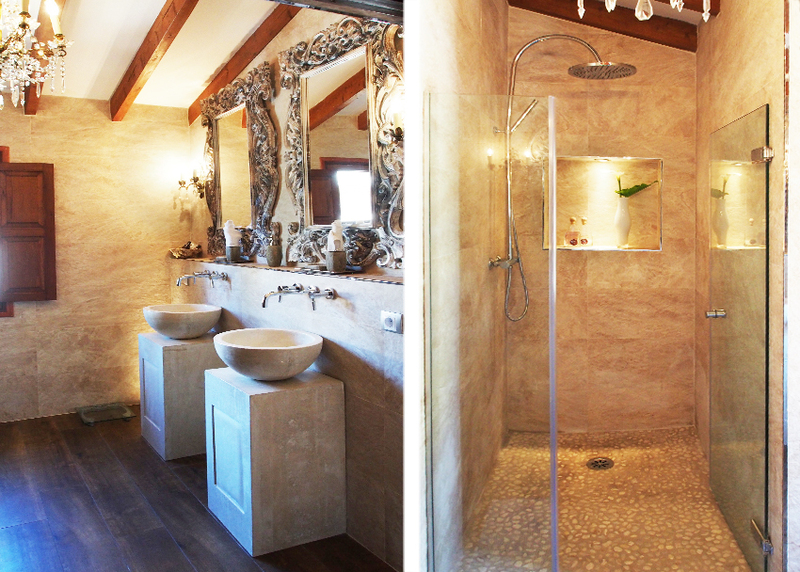 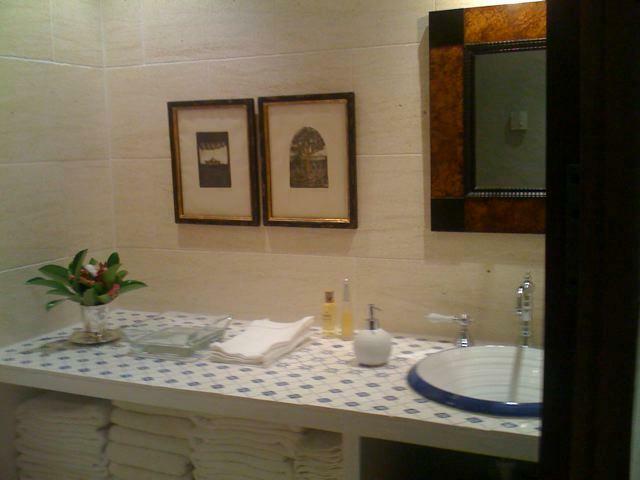 It is decorated throughout with great style and attention to detail, offering accommodation of the highest standard. 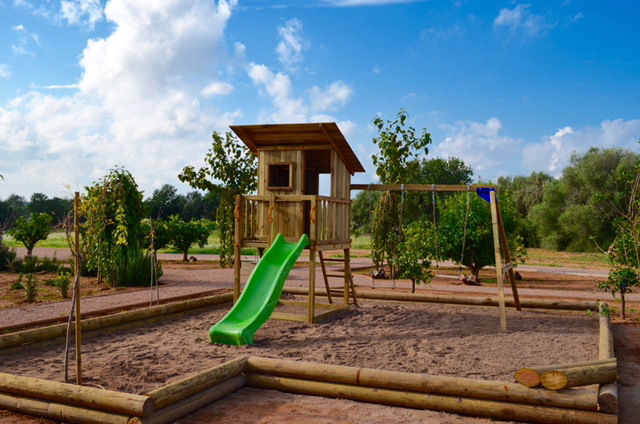 There are ample entertainment facilities for children. 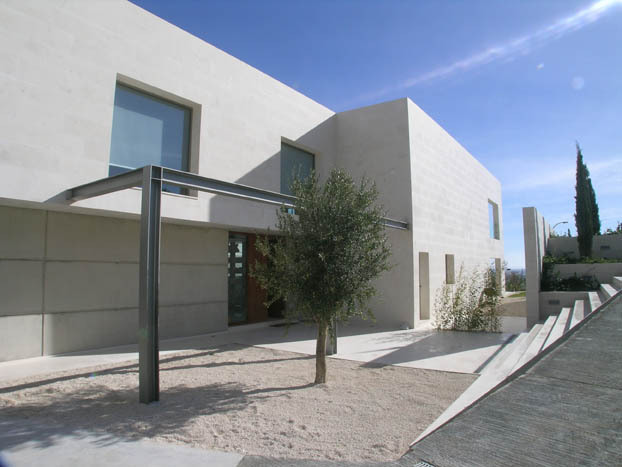 This spectacular new villa is a masterpiece of modern architecture amidst serene nature. 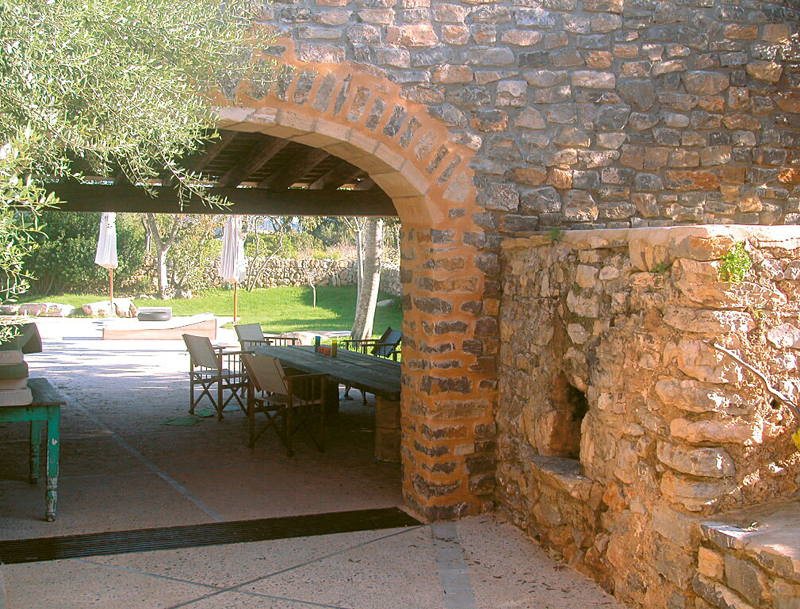 No expenses have been spared with regard to planning, building and decorating the unique holiday retreat. 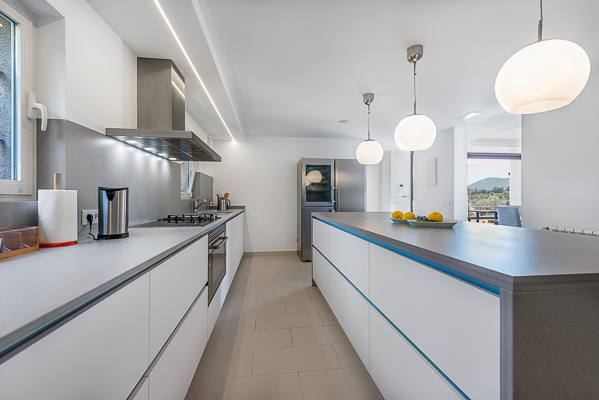 Fair-faced concrete, glass and stainless steel combine with carefully chosen, high-class furniture and décor elements to create an ambience of comfort and luxury. 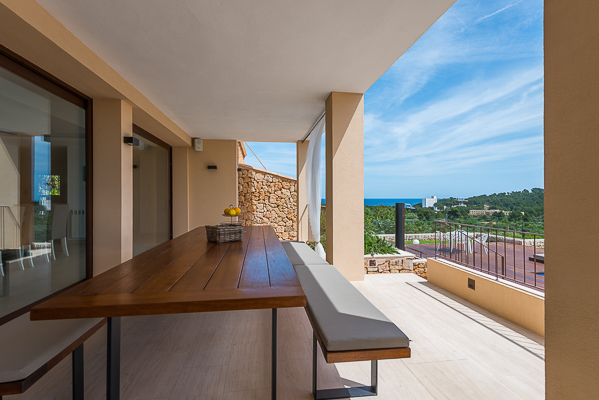 Large panorama windows and inviting terraces give way to unobstructed views across the peaceful landscape to the deep blue ocean. 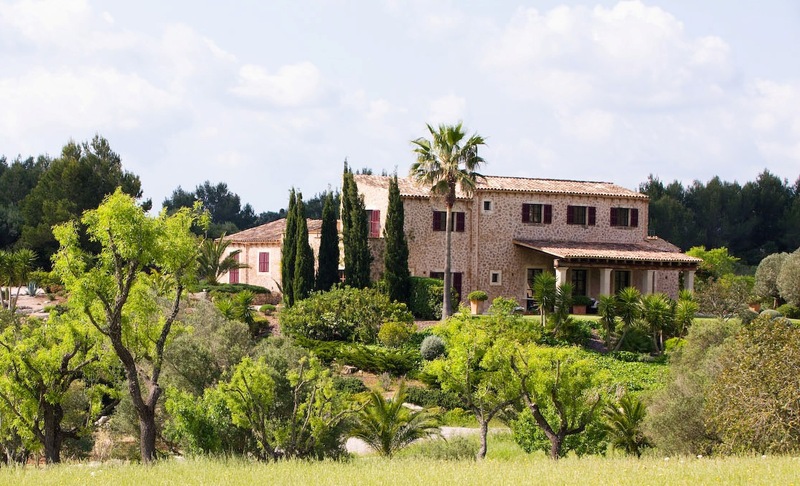 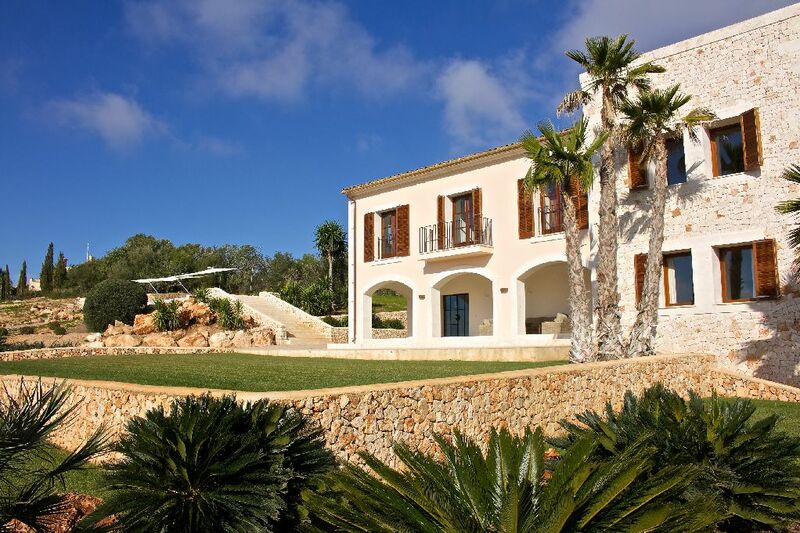 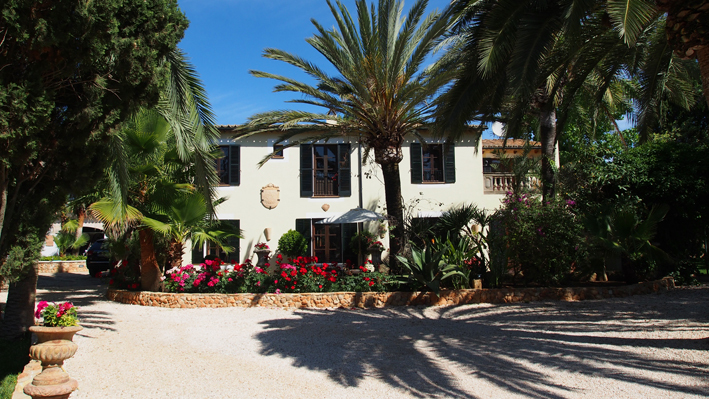 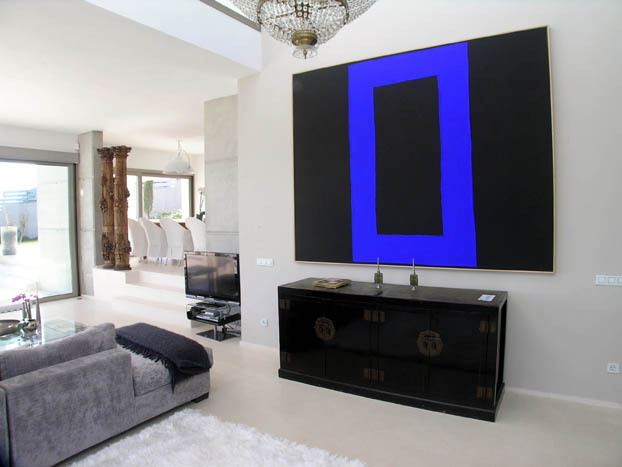 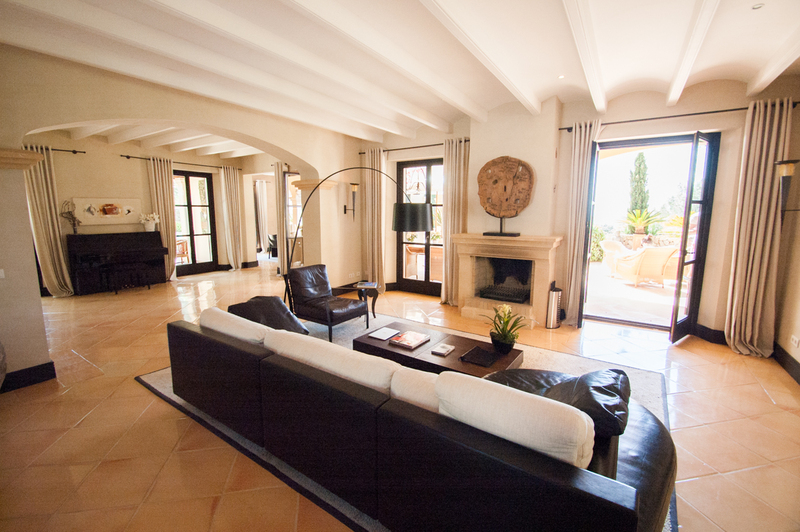 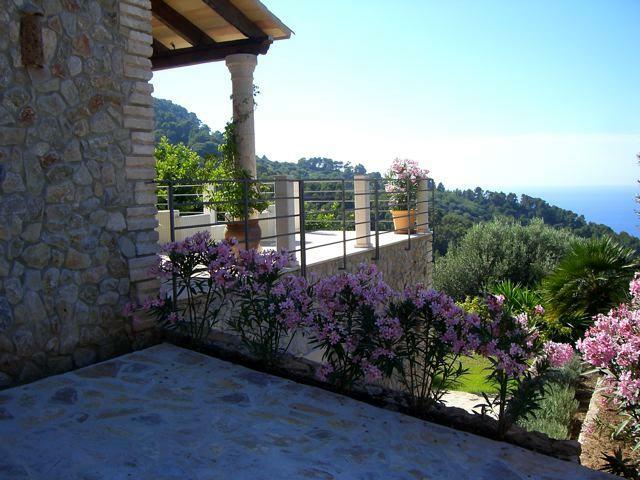 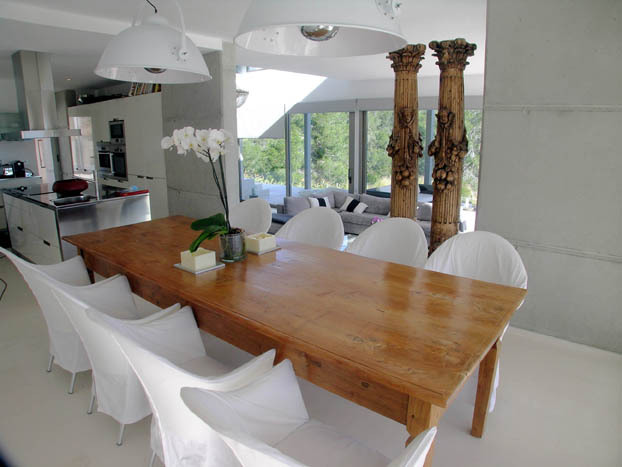 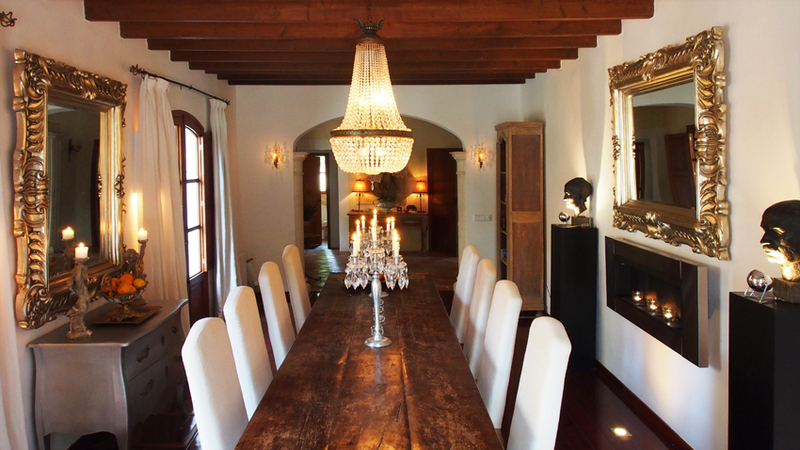 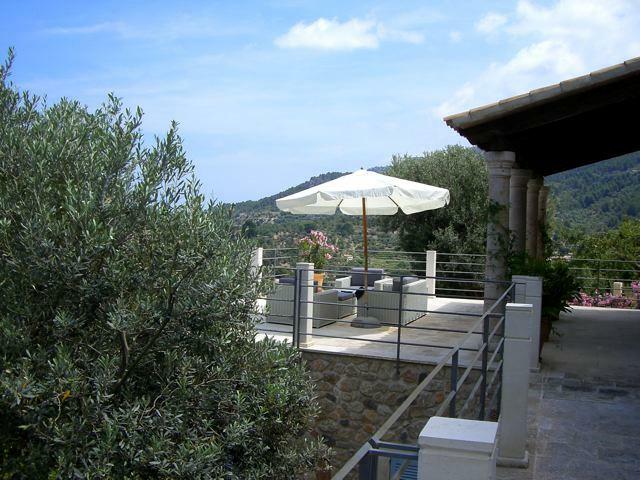 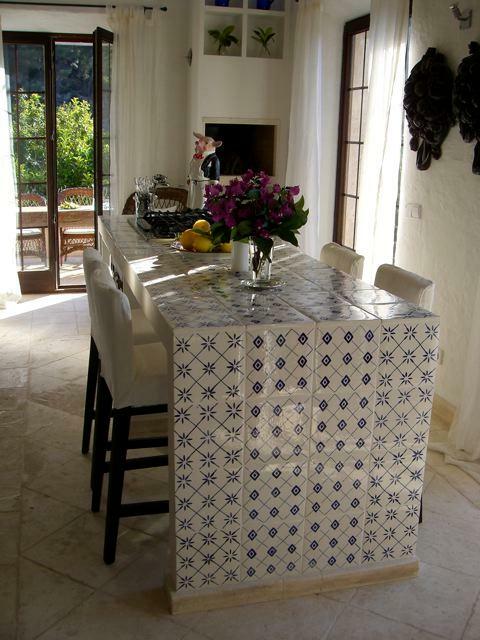 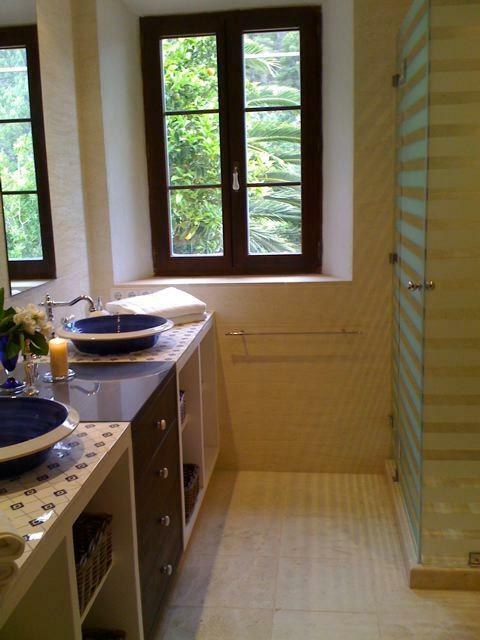 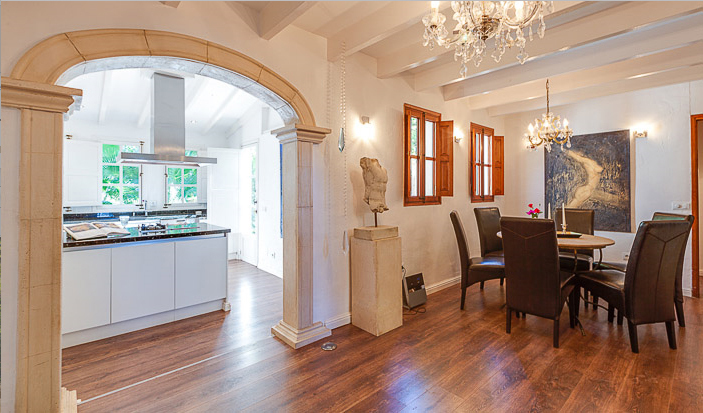 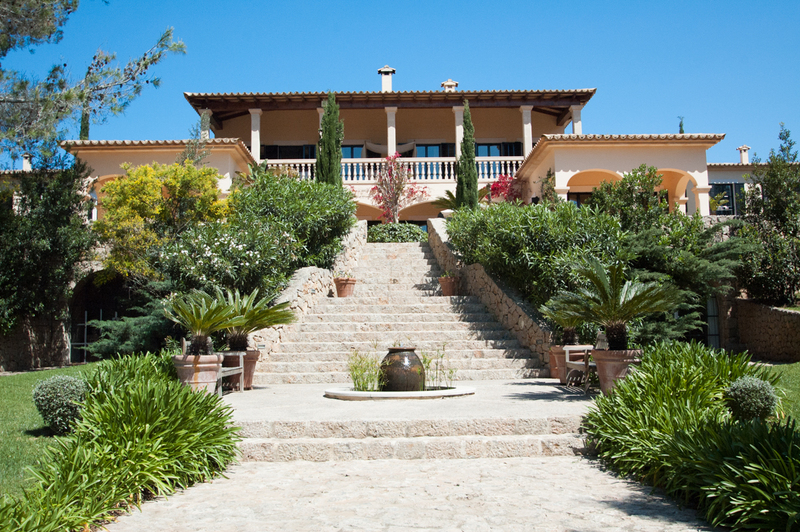 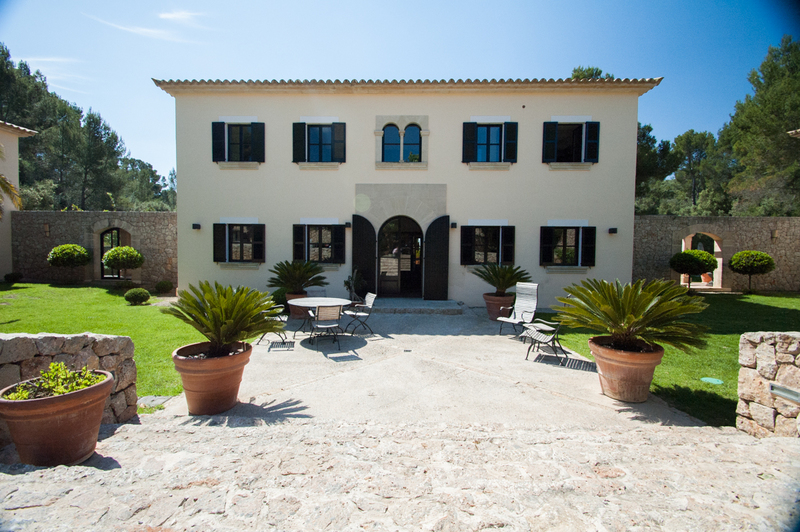 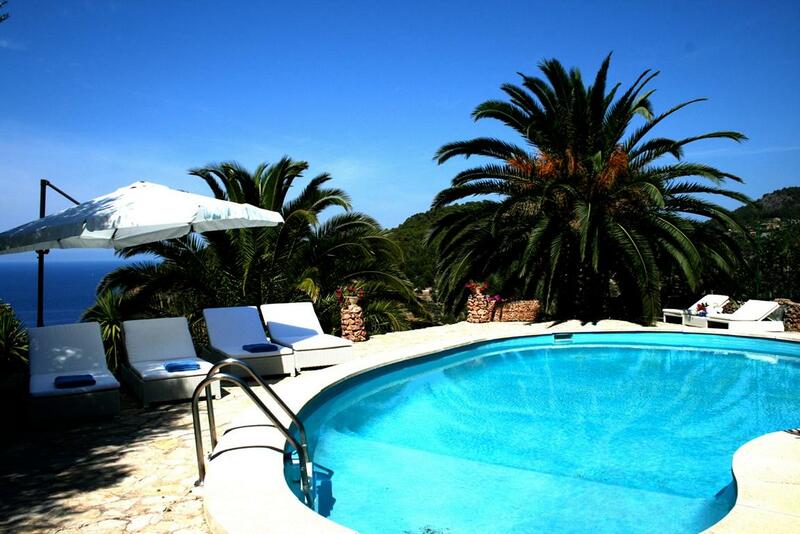 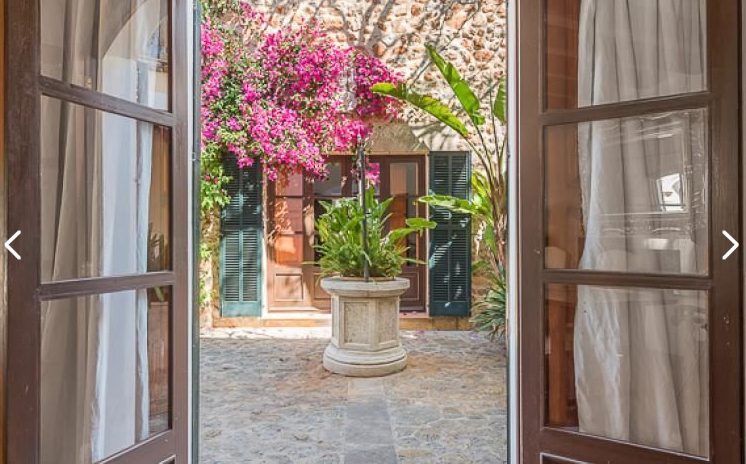 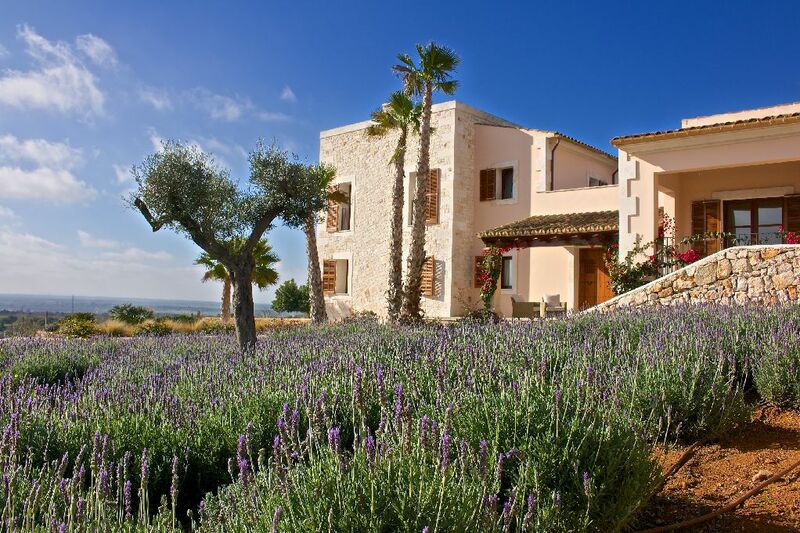 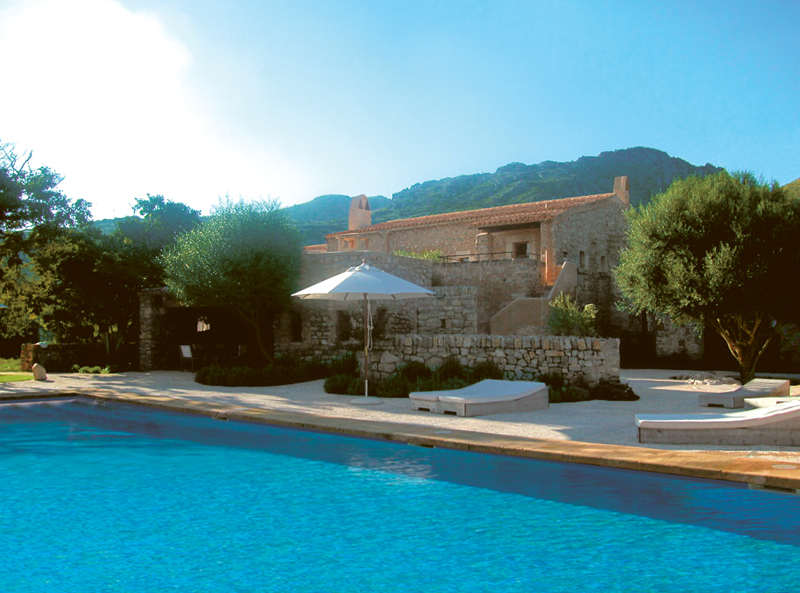 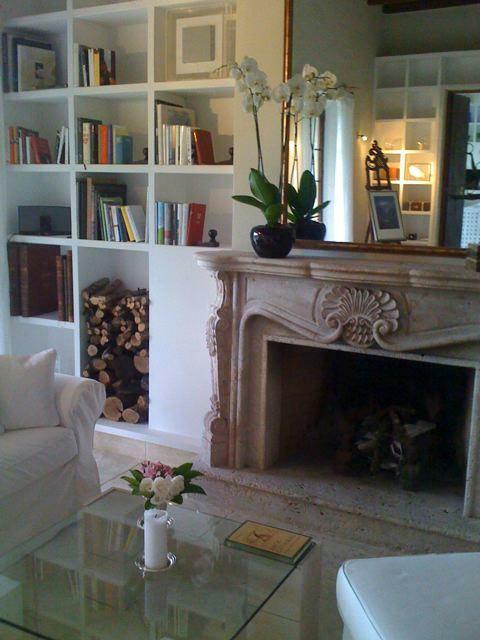 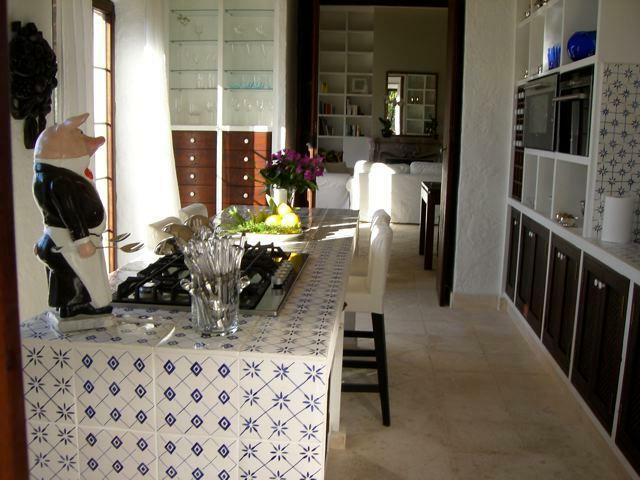 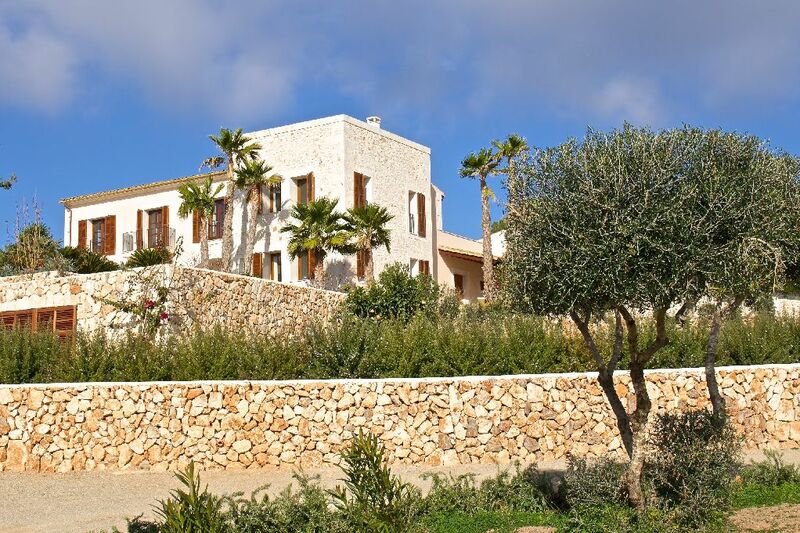 Mallorquin styled villa, situated in a quiet area next to the capital of Mallorca. 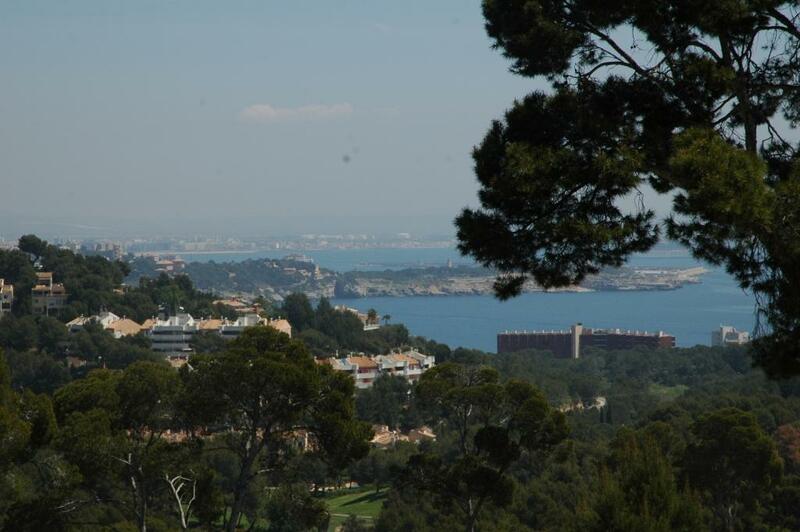 Supermarkets, golf course, restaurantes, beaches and the capital Palma can be reached within only few minutes. 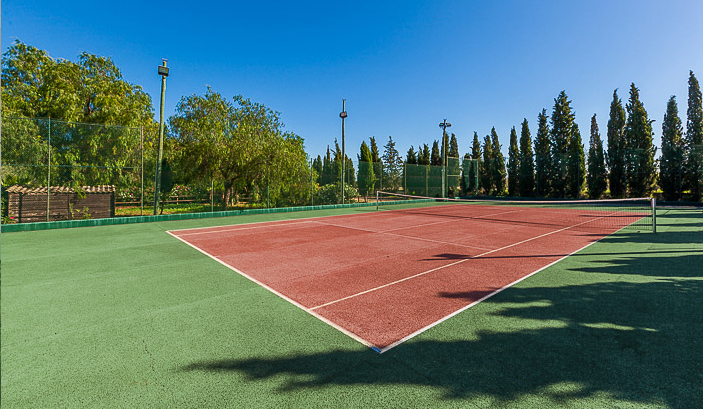 Nova Santa Ponsa is known for its golf courses and green areas, the ideal place for sports enthusiasts. 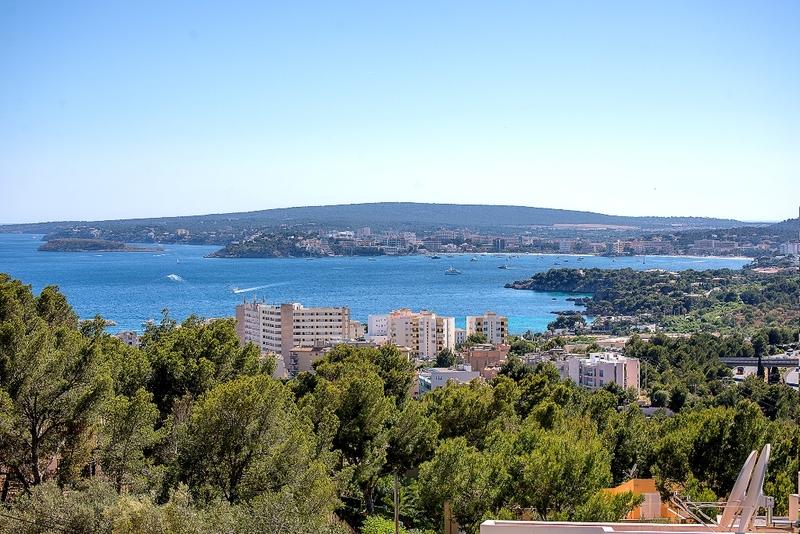 The town of Santa Ponsa with its numerous restaurants and boutiques can be reached in a few minutes. 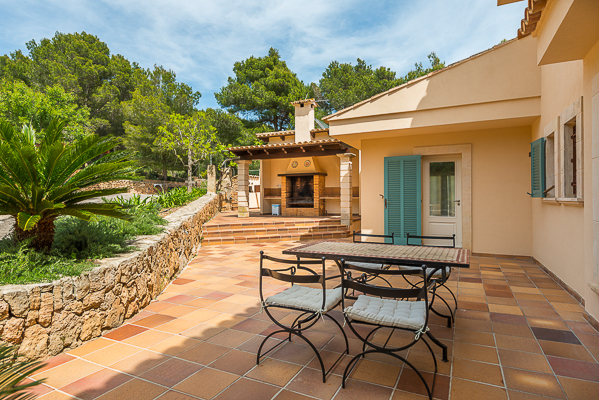 The airport of Palma de Mallorca is 33 km away, thanks to the good access to the motorway you can reach the airport in about 30 minutes by car.